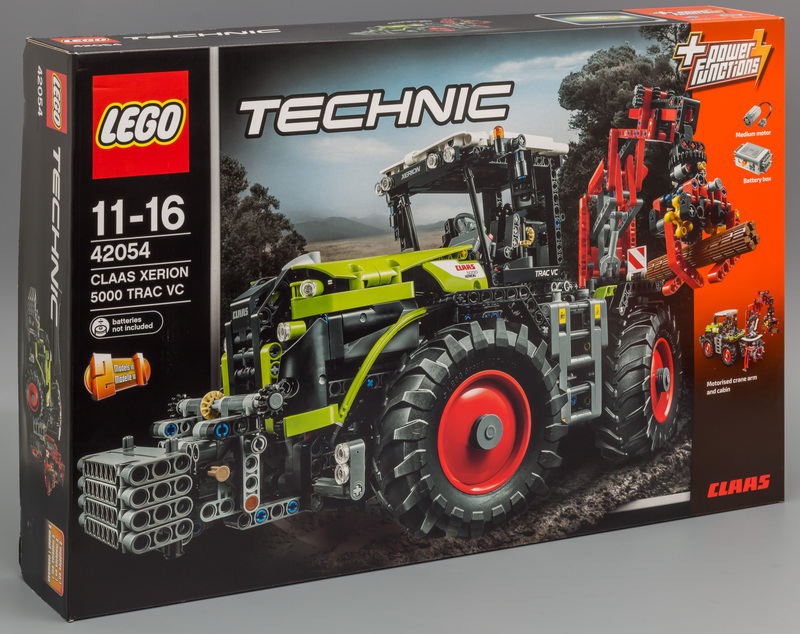 With all the news about the 42056 - Porsche GT3 RS and the 42055 - Bucket Wheel Excavator, you would almost forget there are two other great sets coming up during the second half of 2016. 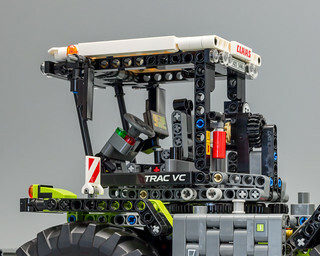 One of which is the 42053 - Volvo EW160E, while the other is the 42054 - Claas Xerion 5000 Trac VC. Today we will be reviewing the latter. 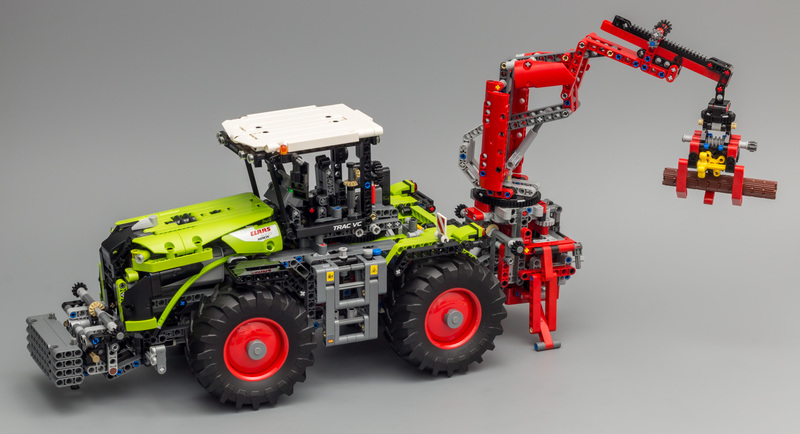 Like LEGO it seems that CLAAS also likes its name spelled with capitals, so from now on I will happily oblige. 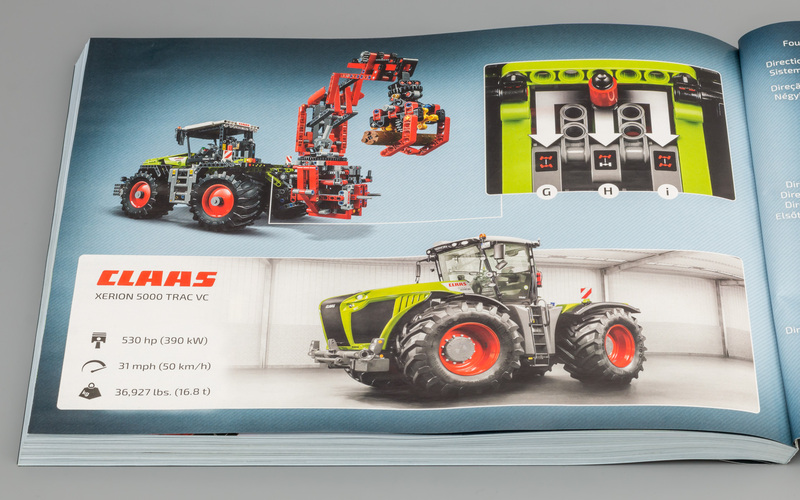 While I live in an area which is flooded by tractors and farm equipment, the CLAAS doesn't seem to be very popular in Holland, while CLAAS is a brand which originated in Germany, not too far away. 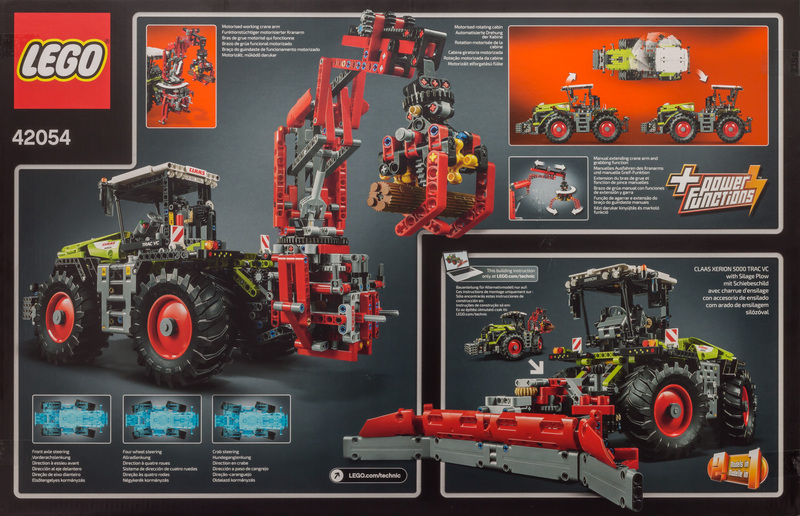 I have never been a real fan of LEGO Technic farm equipment models. To be honest; I have skipped all of them. They just didn't look interesting enough. 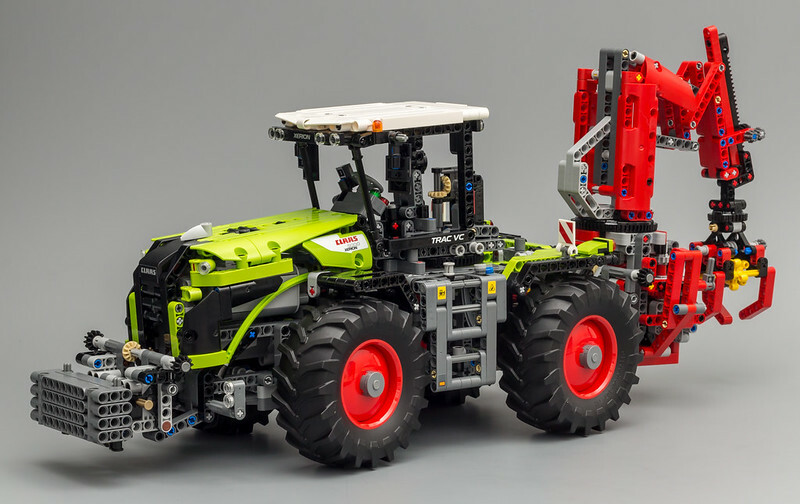 How different the CLAAS is. I'll just throw it out there...this is love af first sight. Sometimes the real model looks even better than in the pictures. 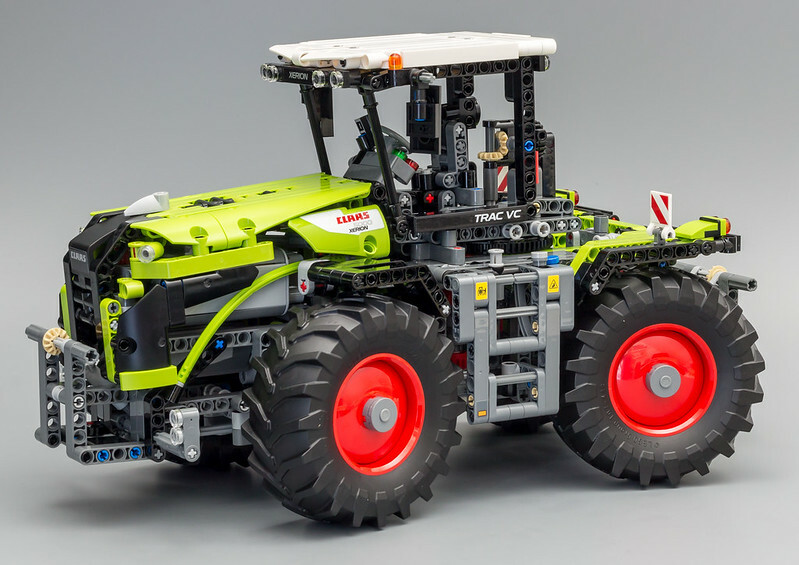 If this is the case with the CLAAS, it's definitely one of the best looking models ever made. Usually you don't draw conclusions in the introduction, but I simply felt the need to address the feeling that I have when I look at this model. CLAAS being one of the biggest (if not THE biggest) manufacturers of combine harvesters, we might be treated with another CLAAS model in the future. 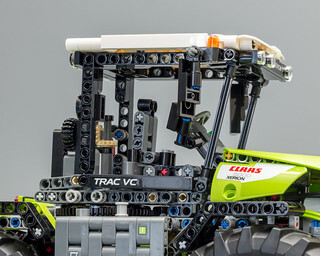 So, not having bought a single farm equipment set, combined with my limited knowledge of real farm equipment, I had to invest some time to get acquainted with the CLAAS XERION 5000 TRAC VC. 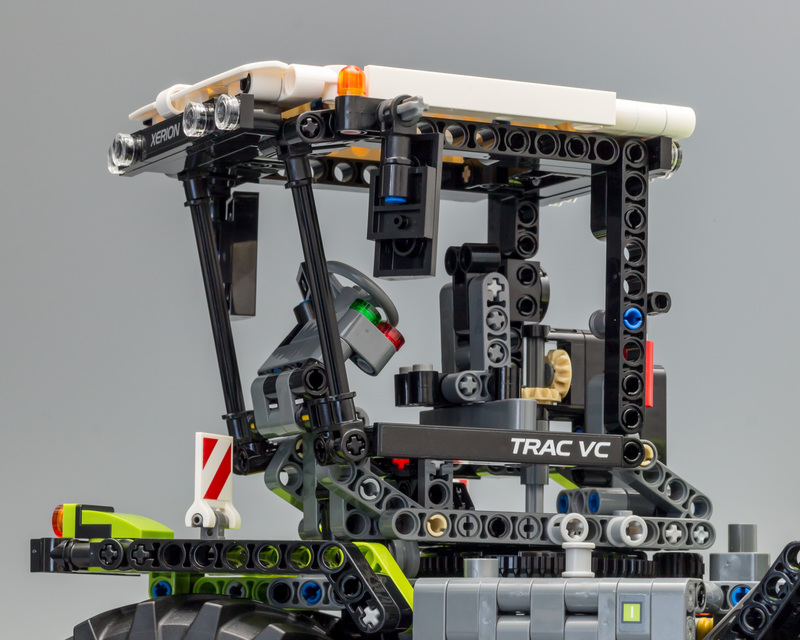 In case you are wondering what VC stands for, it's the designation for Variable Cab, meaning the cab can be rotated backwards, to facilitate driving backwards....or is it forward?! 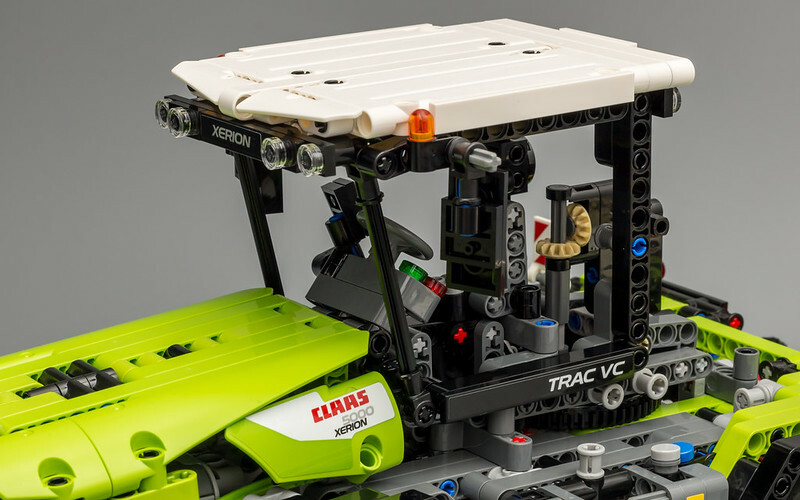 At CLAAS, VC stands for Variable Cab. 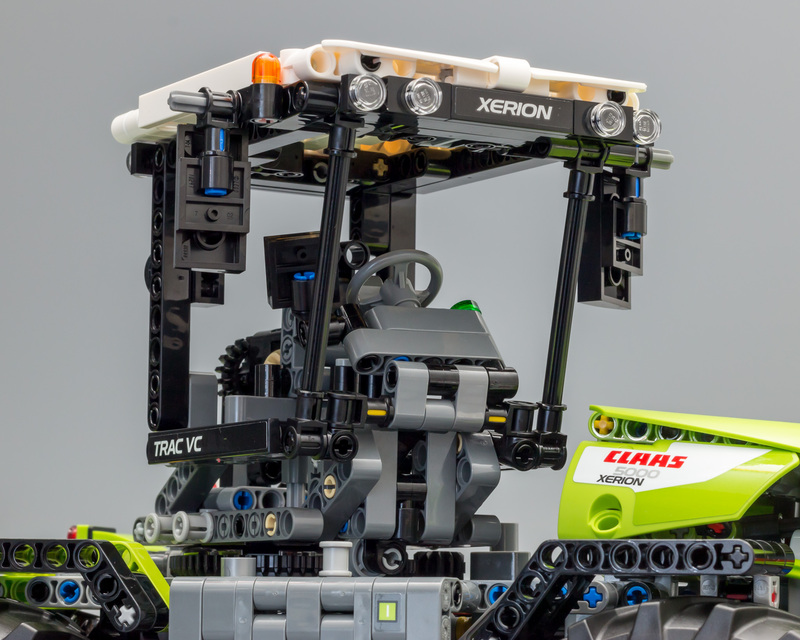 The rotating cab is the most convenient reverse-drive system imaginable. 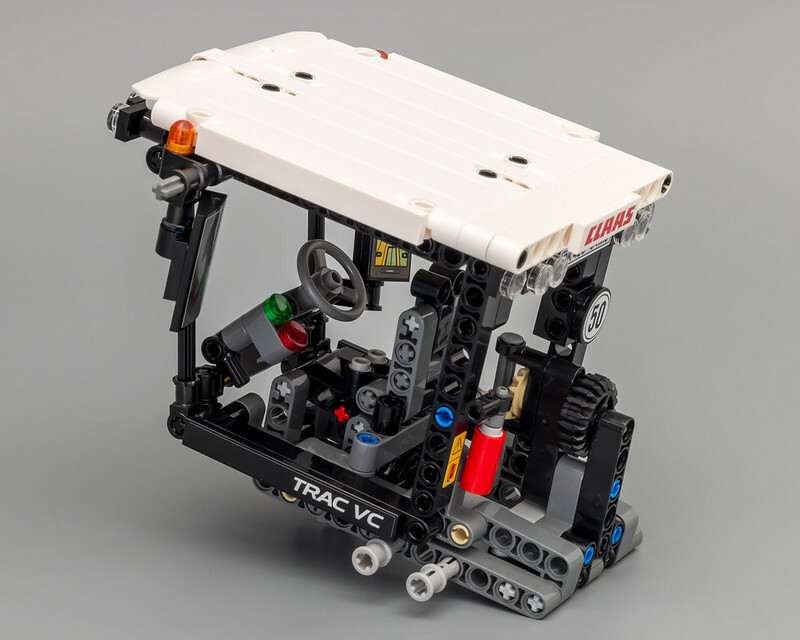 At the press of a button, the entire cab moves from its central position to the rear-facing position above the rear axle in seconds. The controls rotate automatically with the cab, so all functions remain the same when operating in the rear position. For high driving comfort on the road, the cab is centrally positioned between the axles. 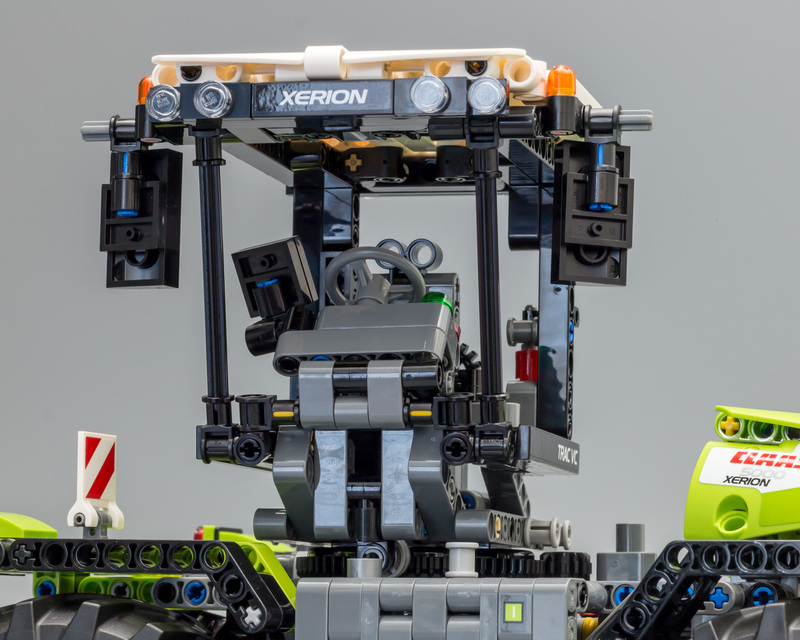 In the silage clamp, on the field, in the forest or in the mountains, the XERION with the cab rotated over the rear axle becomes a user-friendly self-propelled machine with a unique view of the job in hand. If you are looking for more information, here's the Brochure and Technical data. 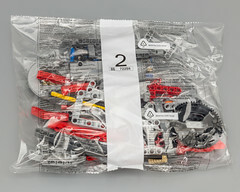 Funny fact about this set is that it's simply addressed as one of the 2H 2016 sets, while with almost 2000 parts, it would definitely have qualified as a flagship a couple of years ago. 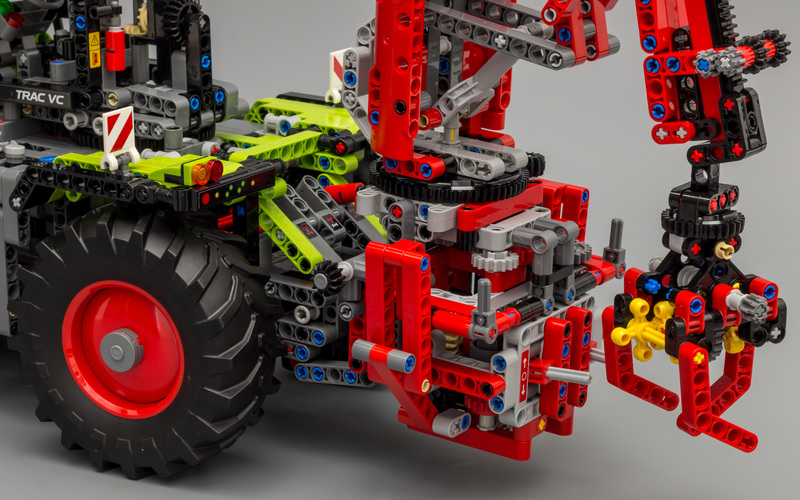 This is a clear indication that the Technic product line has been evolving rapidly. I start to wonder how big this model actually is. Let's open the box and find out. Having the Porsche and BWE around almost makes you forget that this isn't the Prima Donna of 2016. The box doesn't help either, since it's quite a big lady. A few years ago it could have easily passed as a flagship set. As usual, the front shows a nice picture of the model. The right side indicates that this is a PF powered set, where the M-motor and PF Battery Box are included. Bottom right tells us the crane arm and cabin are motorized. 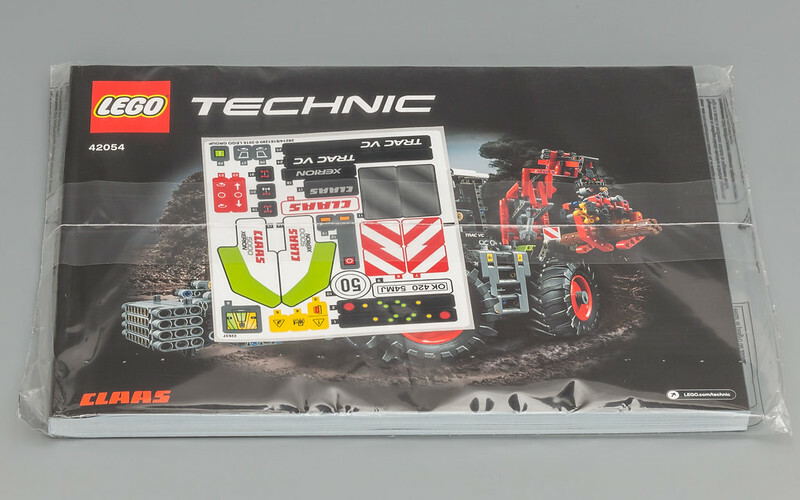 At this point it's not exactly clear what the motorization entails, but I bet the backside of the box will show us more details. The back of the box (click to enlarge) shows us that the boom of the crane can be raised and lowered using Power Functions, as well as rotating the crane. Also, the cabin can be rotated using Power Functions, which is obviously super cool! I'm really anxious to find out how this works. The lower left corner shows us the three steering modes of the CLAAS XERION. Yes, you heard it right, three steering modes! 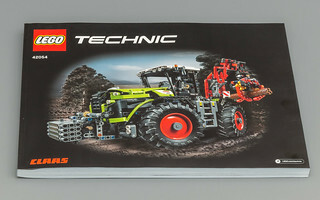 Just like the Porsche should have had The lower right corner shows a picture of the B-model, which is actually the same tractor, with a different attachment. The crane has been transformed into a silage plow. As you can see, the cabin (and thus controls) are facing a different direction than in the picture of the A-model. Like the Unimog I expect lots of modifications and attachments for this model! This is how it looks when you throw everything on one big pile. 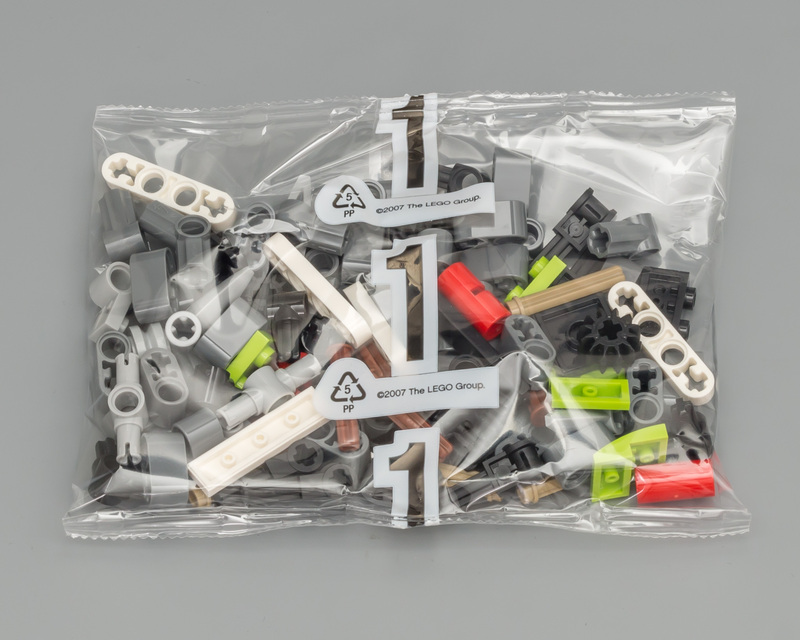 The instructions are provided in a square bound book, sealed in a bag with the stickers. 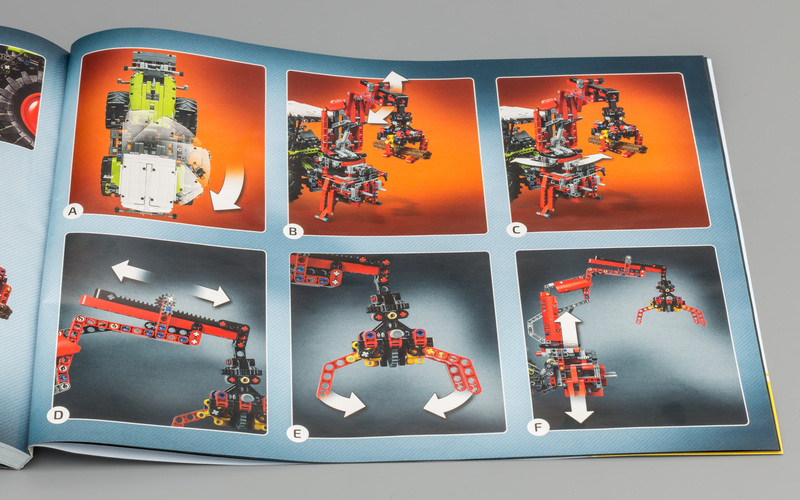 I really like this way of packing the manual and stickers. Keeps both the book and sticker sheet unharmed. 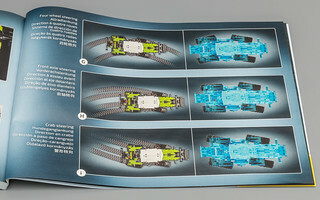 Below are detailed pictures of the book and sticker sheet. 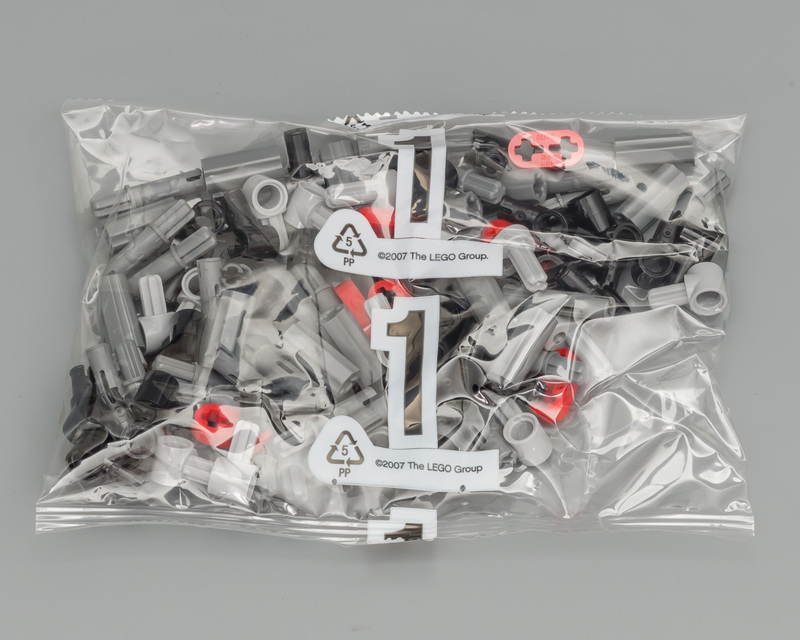 The latter contains lots of little stickers for switches and controls. 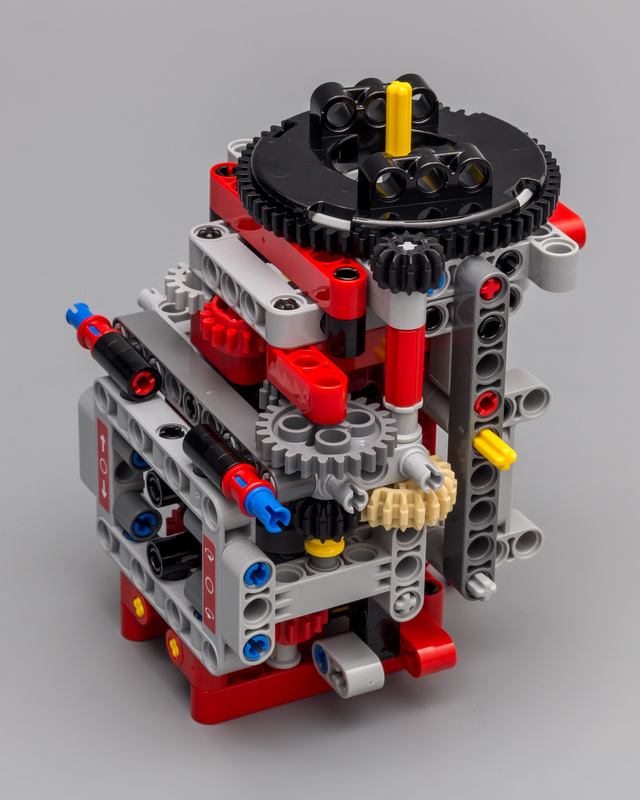 This means the model will have lots of functions....yay! A PF Battery Box and a sealed PF M-motor. 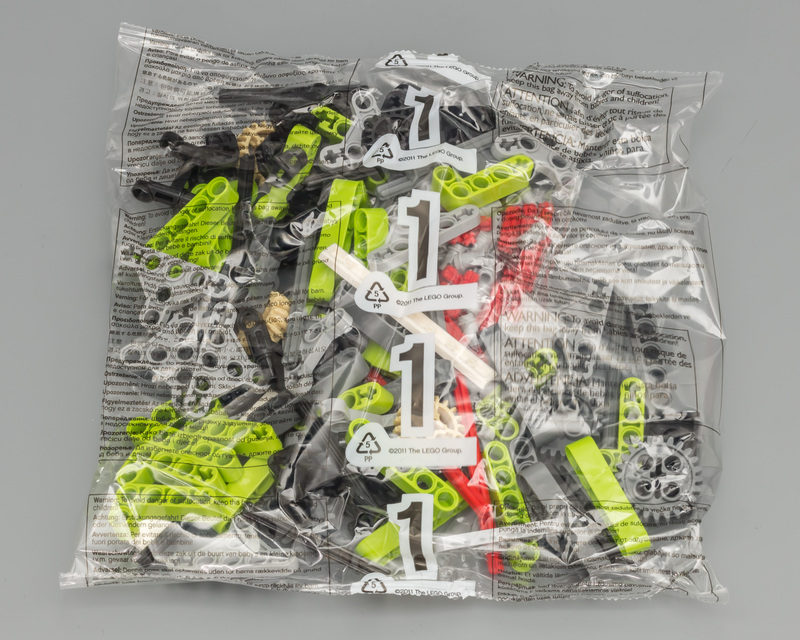 Without a doubt the single most eye-catching elements when opening the box are the new tires! Back by popular demand is the Highlighted parts section. For this set it's quite elaborate. 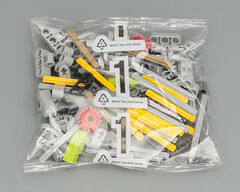 Not because it contains loads of new parts, but it does contain quite a few new-ish parts in large numbers. 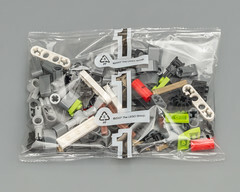 This indicates that the designer used some of the new building techniques in this set. 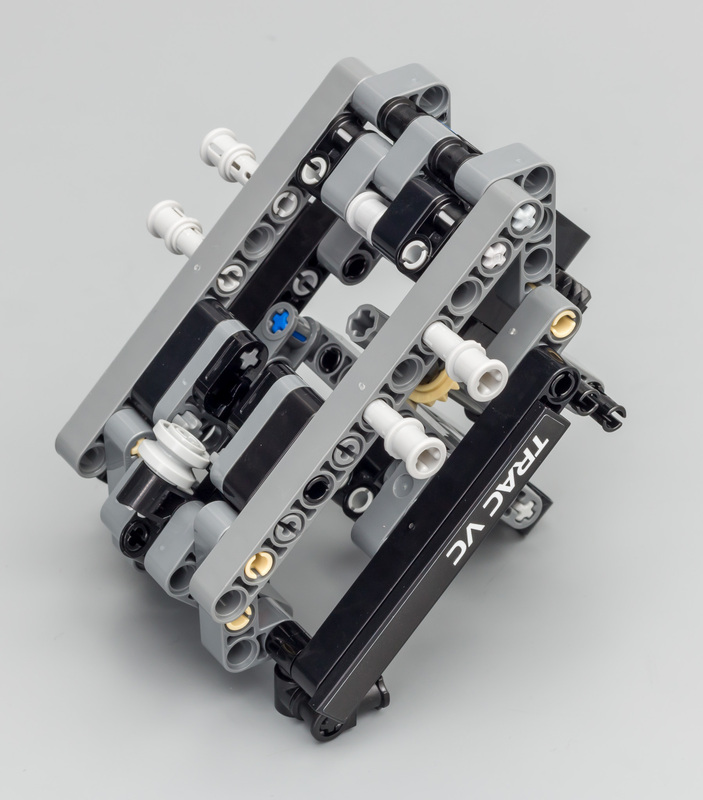 And there's something funny going on with the axles, so let's start with those. Red and Yellow axles have been introduced in most of the 1H 2016 sets. 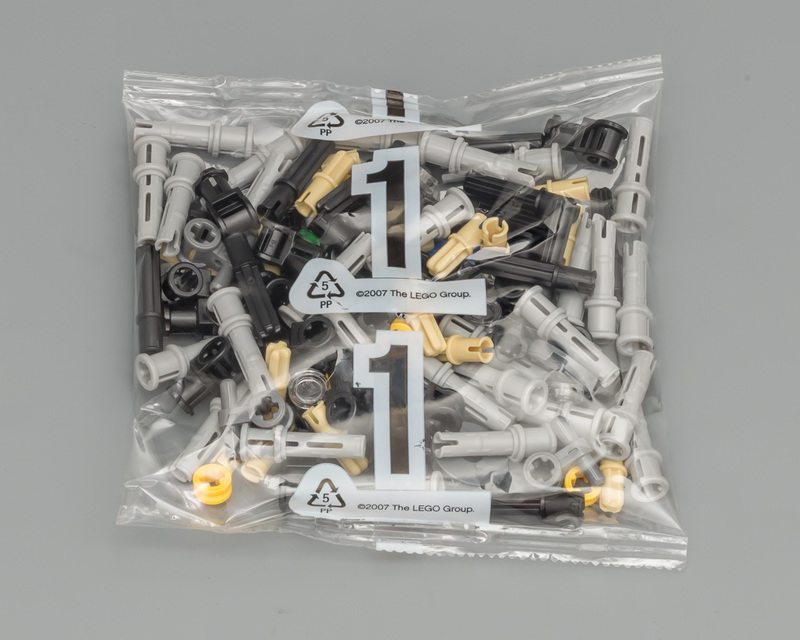 What's striking though, is that this contains axles in both the regular black and grey color, as well as the latest yellow and red versions. 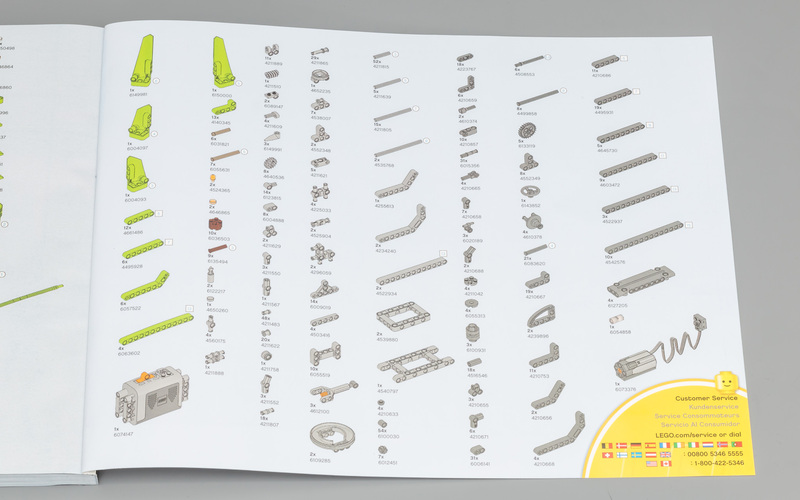 Here you can see that we get both the grey and yellow 5L and 7L axles. I have included only a single grey version to make my point. 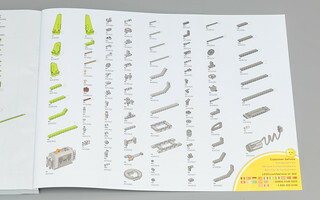 Actually there are 11 yellow and 5 grey 5L axles and 6 yellow and 15 grey 7L axles. 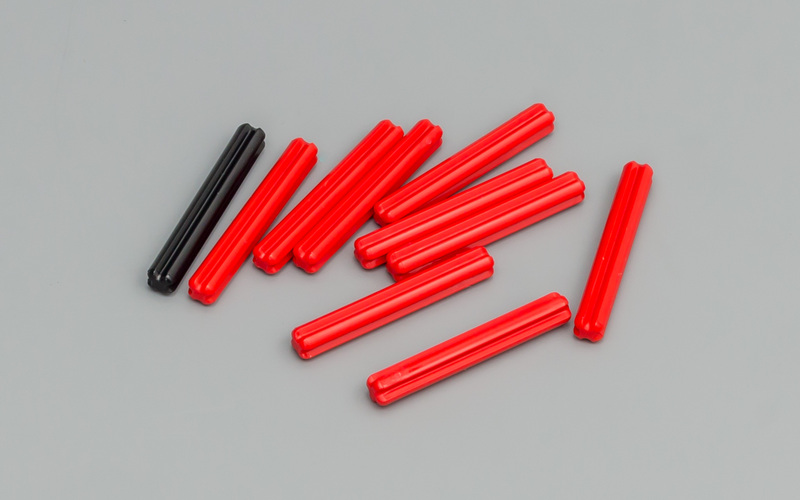 Same goes for the red 4L and 8L axles, which have a black counterpart (also a single one included in the picture). 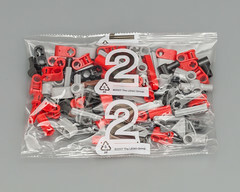 This set contains 9 red and 4 black 4L axles and 2 red and 2 black 8L axles. Makes sense, right?! 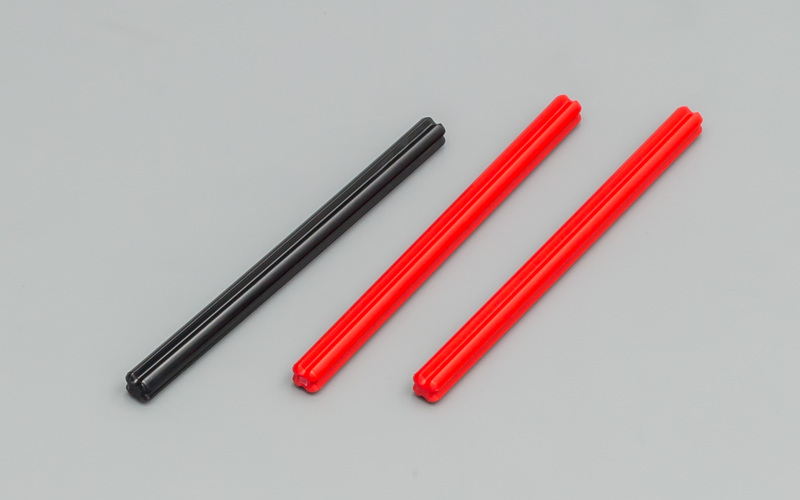 At this point I am really starting to wonder what the strategy behind the axle color distribution is. Is TLG getting rid of their old stock or is there a better explanation? Hopefully we will discover some logic, but I highly doubt it. 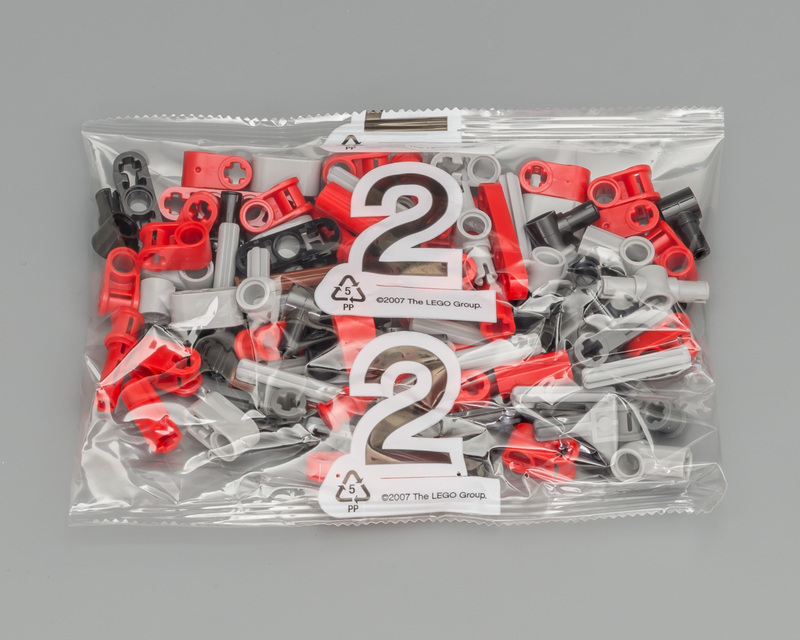 On the left you can see the new (2016) 3L Axle with Stop and on the right you see the 2012 4L Axle with Center Stop. Inclusion of the latter is not so special, if it weren't for the quantity. 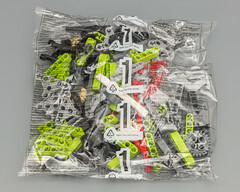 A total of 12 are included, which is more than in any other set. 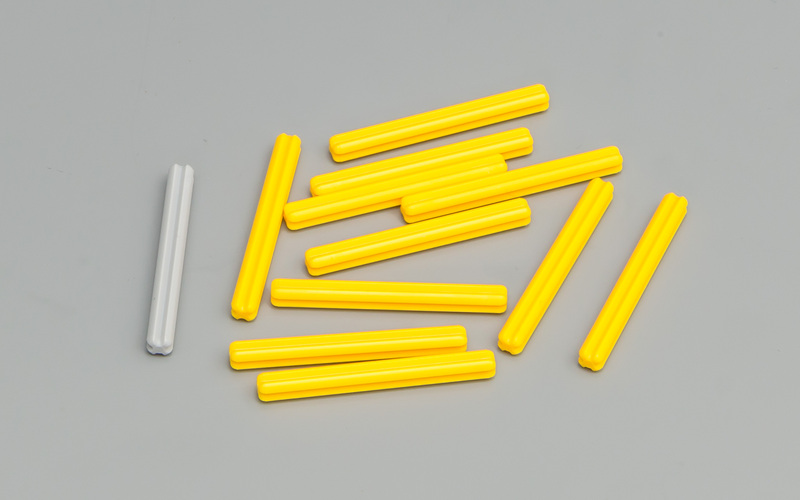 And even a single 11L axle in yellow, which completes the uneven yellow axle family (3L, 5L, 7L, 9L and 11L). Fun fact; the 3L axle in yellow has been introduced in 2015 (in the LEGO Ideas Wall-e set) and has been used in quite a few 2016 sets, but not in any of the Technic sets. 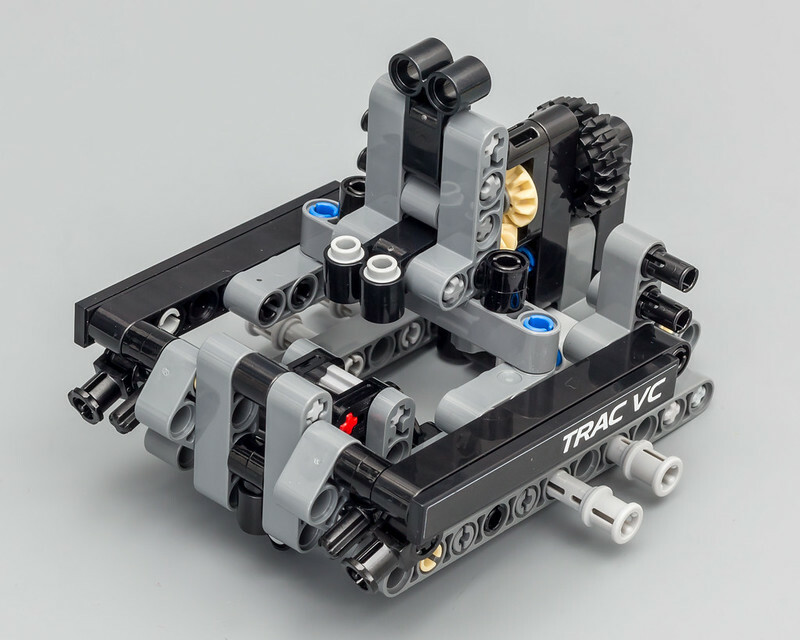 Same goes for the 9L axle, which has been used in three non-Technic sets. Adds another layer to the axle mystery. 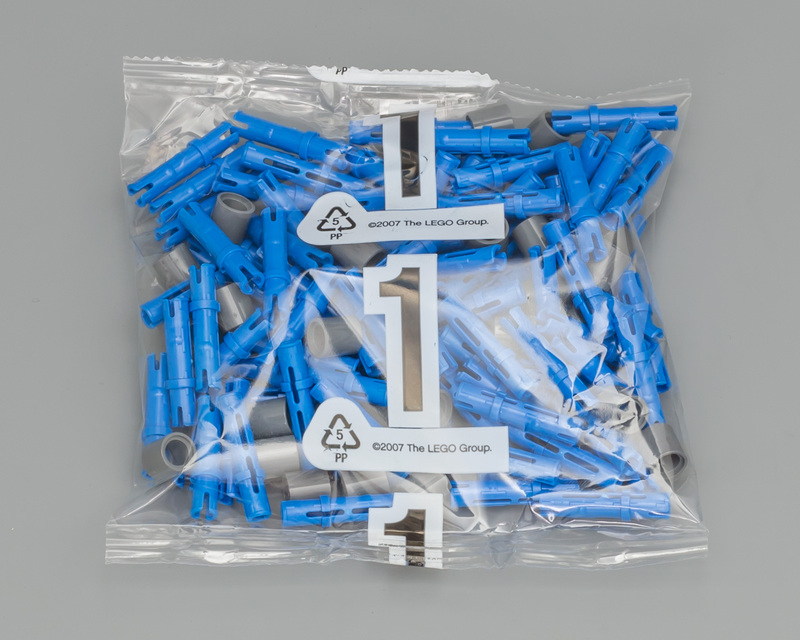 Let's talk Pins and Pin Connectors. This set includes 20 3L Pin with 2L Axle from 2015 and a whopping 31 3L Pin with 1L Axle from 2014. If you are in need of Pin with Pin Hole from 2014, look no further. 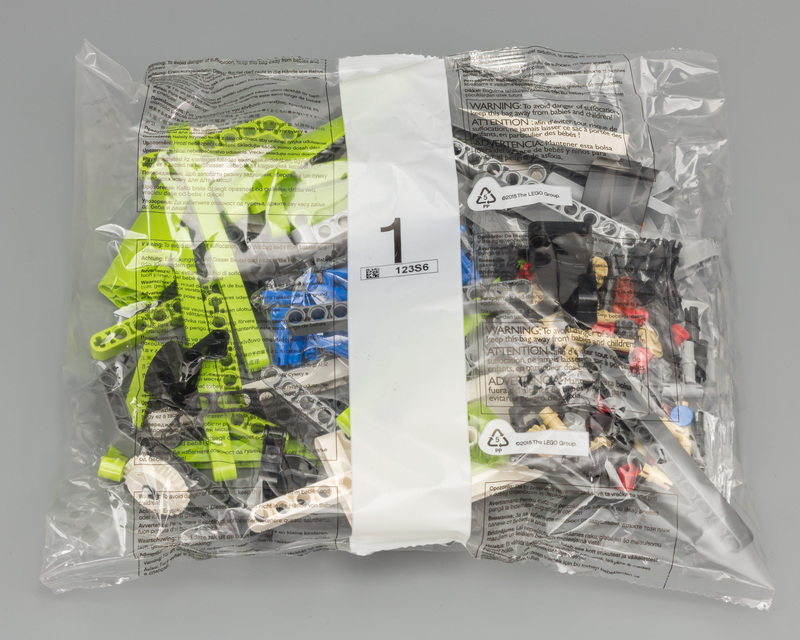 This set contains 49 of 'em. Yes that's right, 49!! And 14 of its axle counterpart Axle with Pin Hole from 2016. 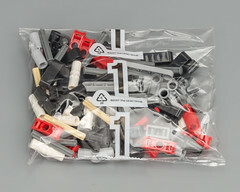 This set also comes with 12 Axle and Pin Connector Hub with 2 Axles. Already introduced in 2012, but relatively new in black. Introduced in 2015, received with some surprise from the community. 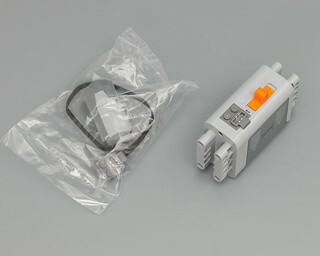 Why do we need this 1L Pin Connector?! Well, there's 54 in this set so we are bound to find out why it's useful. 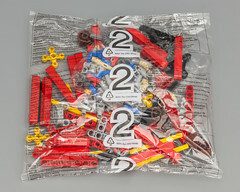 In my review of the 42023 Construction Crew (one of my two first reviews) I introduced this part. 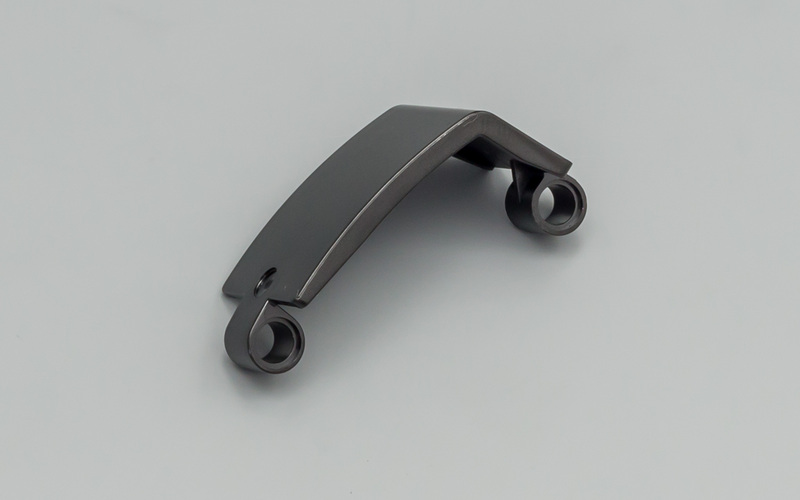 The Liftarm 3 X 5 Perpendicular H-Shape Thick a.k.a. 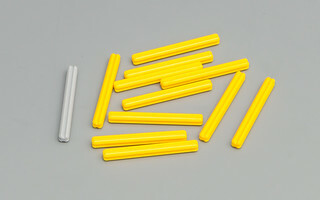 Dog Bone Frame or H-Frame. A compact versatile frame which appeared in quite a few sets but never in such quantities. 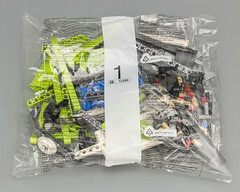 This set contains 10 of them. 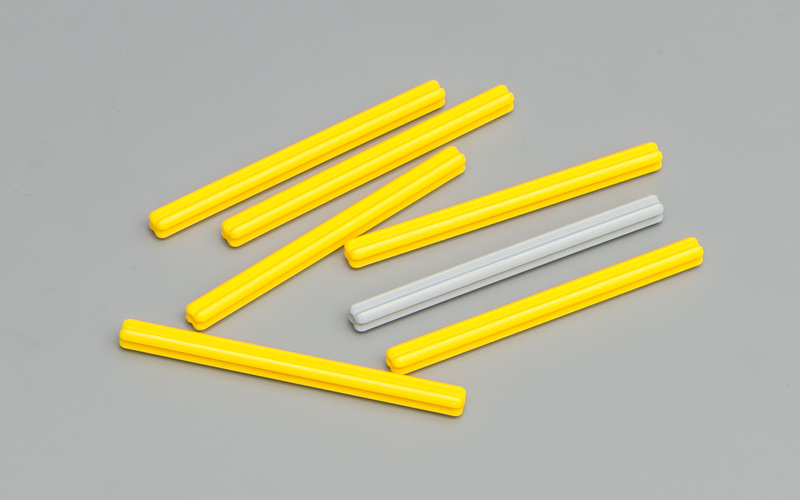 The 3 x 6 x 3 Curved Panel was already available in blue and yellow and now it's also available in black. You only get a single one in this set though. This new turntable was introduced in 2015 and it's the first time it appears twice in a single set. It's comprised of two parts, The Top and The Base. 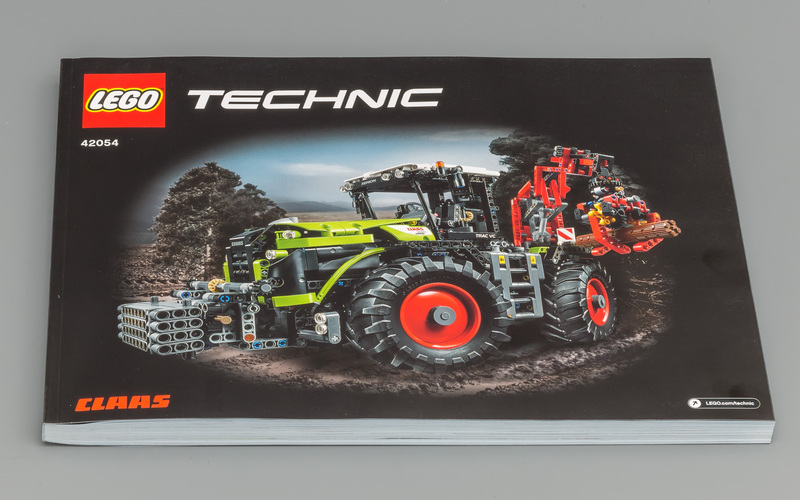 Introduced in the Porsche (only because it was available first) and now also available in the CLAAS. Two of them in the Porsche but if you like to build 4W steering this is the set for you. 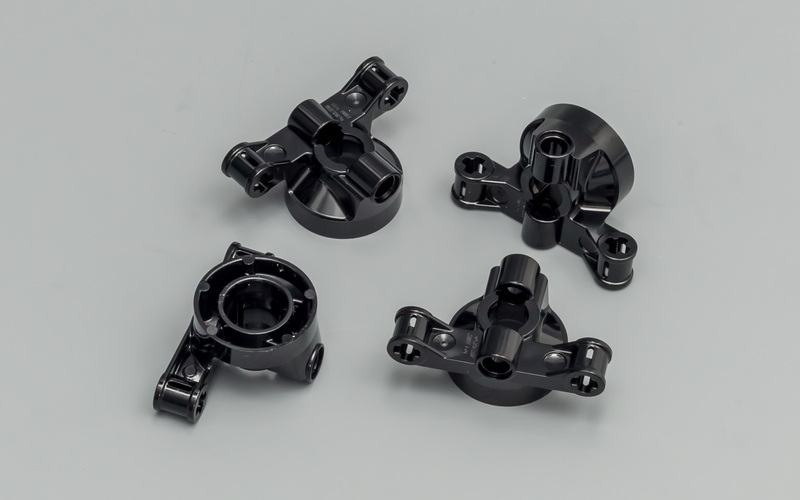 It contains 4 Steering Wheel Hub Holder with 2 Pin Holes and 2 Axle Holes. 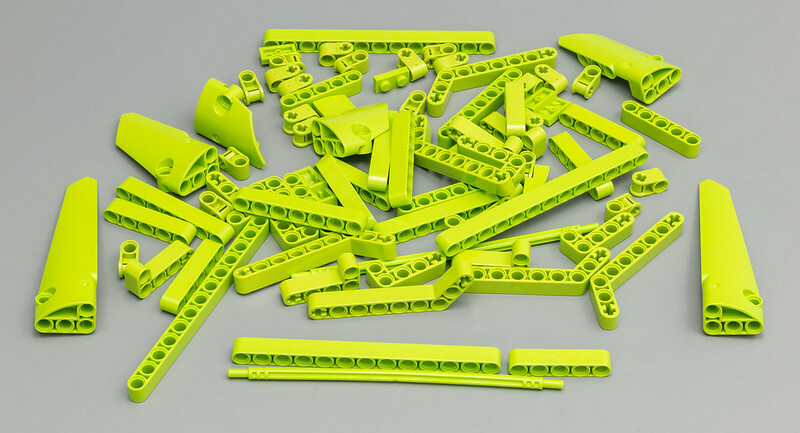 A reasonably large selection of lime green parts. 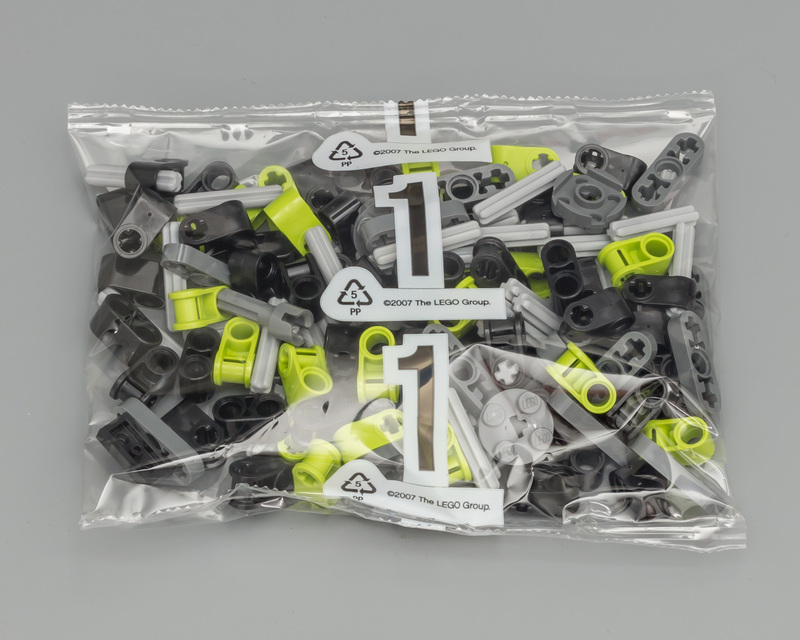 Not sure if it's visible in this picture but apparently lime green is the new yellow, when it comes to parts being identically colored. 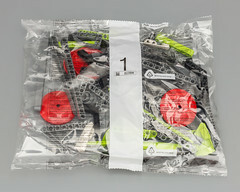 Variation in lime green is significant. This picture shows a detailed view of the color difference. It's clearly visible near the 2x1 plate. 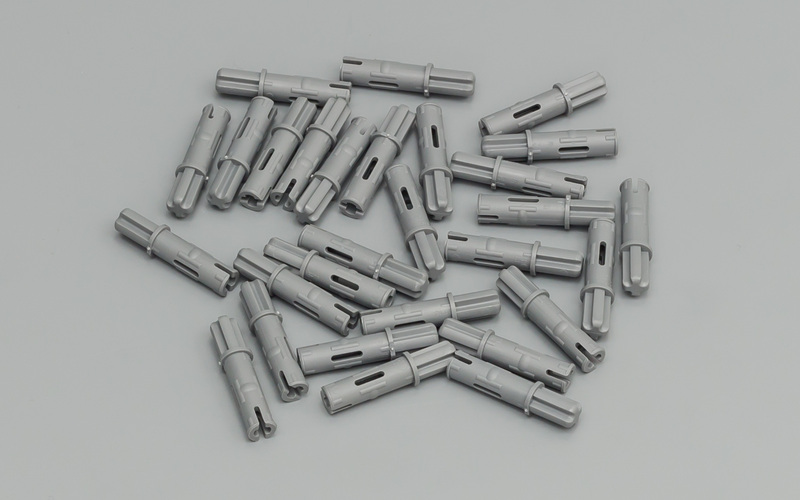 The connectors and liftarm do differ as well. 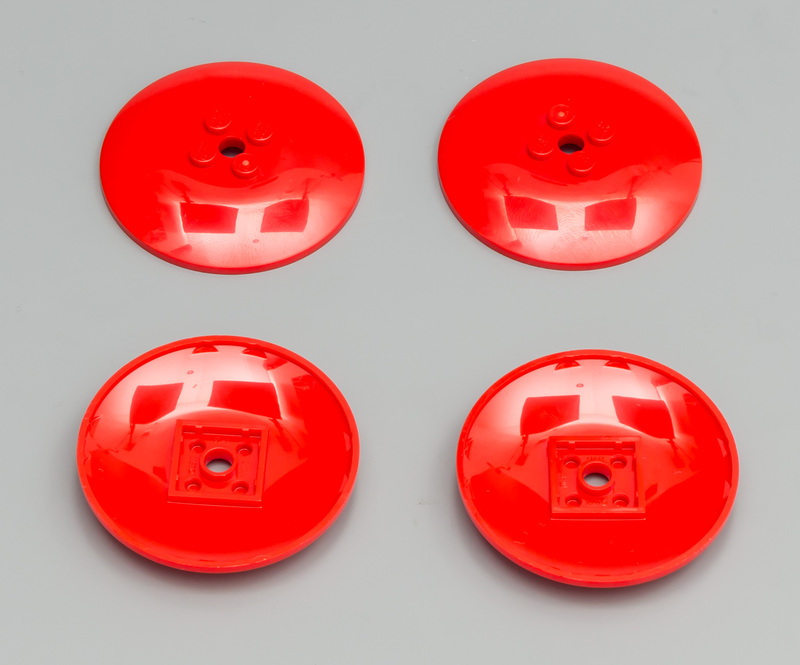 This 6x6 Inverted Rader Dish isn't new, but it's the first time we see it in red. This picture also shows the reflection of the light bounced off the ceiling. 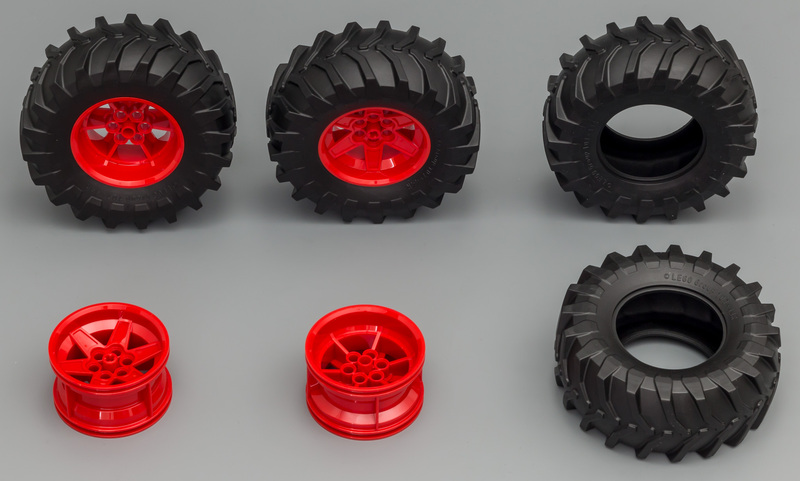 The rims are your run of the mill 56mm D. x 34mm Technic Racing Rims, with the unique feature that, like the 6x6 Inverted Dishes, these come in red for the first time. Four brand new 107 x 44R Tractor Tires! 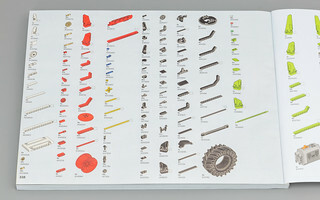 Here's the complete list of 1977 parts. 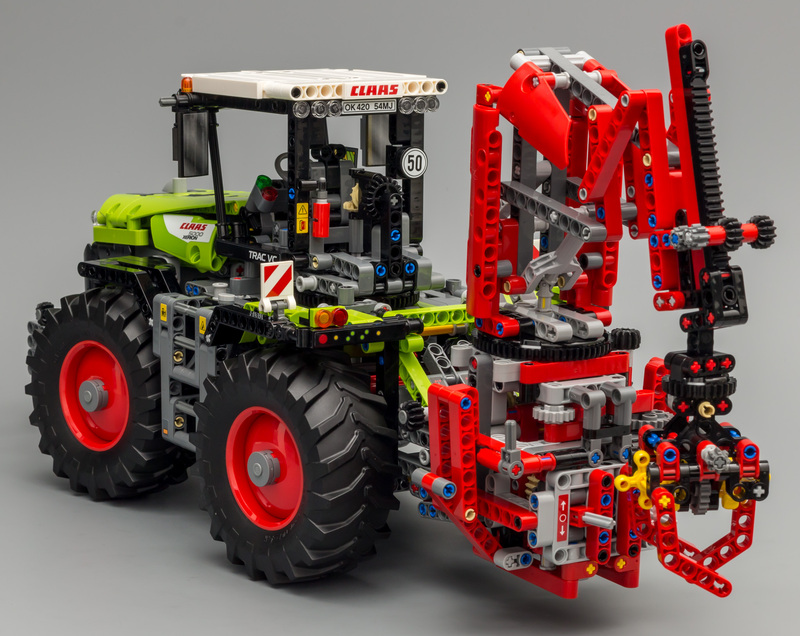 The build consists of two phases, the tractor and the crane. Obviously we will start with building the tractor. Get your #1 bags, rims, tires and PF components....we are about to begin! We start by building the chassis. The back side of the chassis to be specific. You can already see part of the steering mode selector mechanism taking shape. 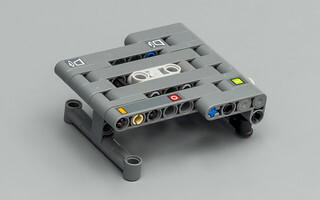 The manually operated rear mount which will later be used to attach the crane (or other attachments). Manual operations include raising and lowering the attachment. 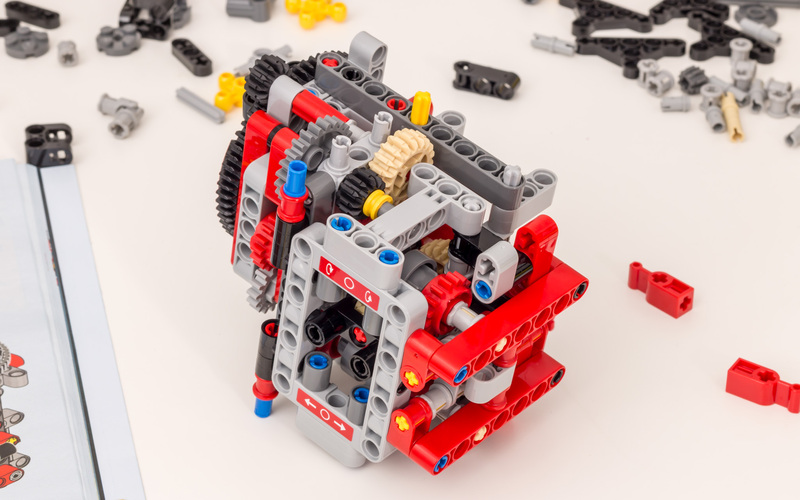 There's a PTO (Power take-off) which will be connected to the PF motor, so it's not operated manually. Here you can see the rear mount attached to the chassis. 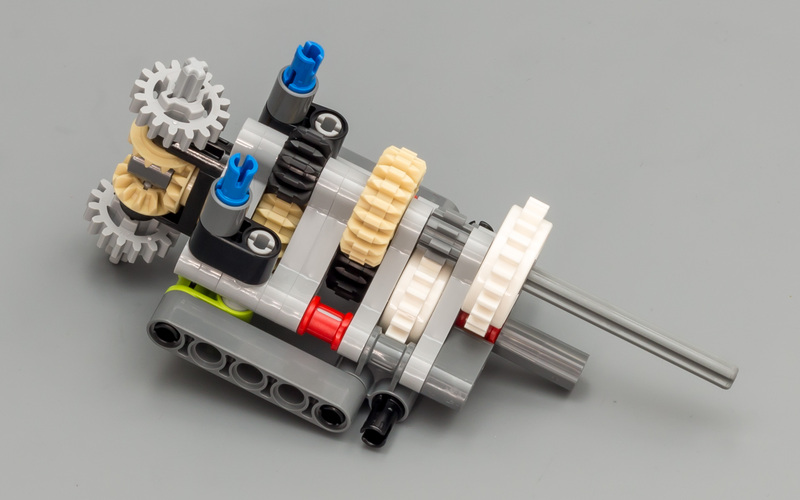 The bottom view shows the PTO drive shaft. 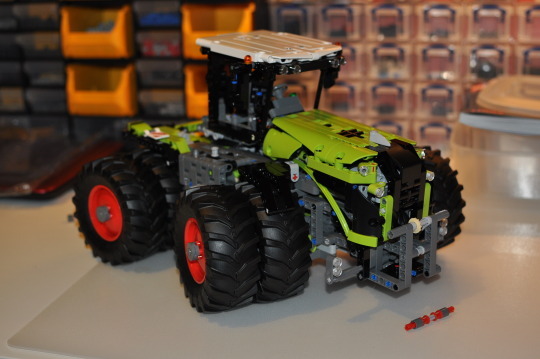 Since this tractor has 4 wheel steering, the rear axle also needs to be steerable. 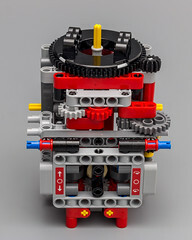 To accomplish that, the new wheel hubs are used. 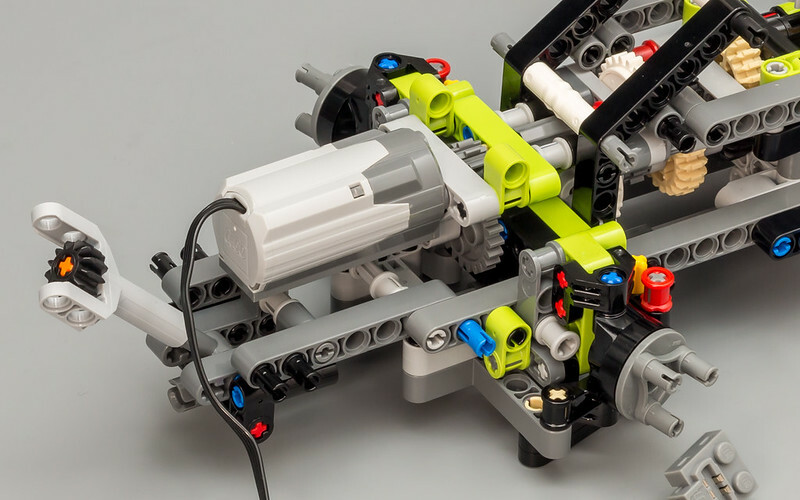 No rack and pinion yet?! Or no rack and pinion at all?! I was wondering why the blue Axle Pin is used in favor of a Pin without friction. 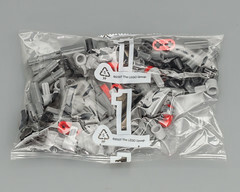 Normally my best guess is that these parts are used in the B-model, which isn't the case for this model. 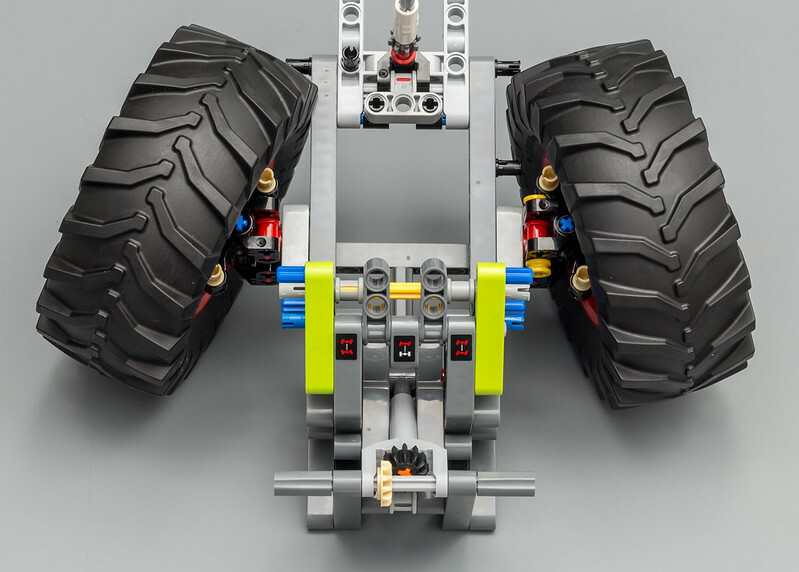 The only possible thing I can imagine is that the friction is needed to prevent wobbling, and the axle end makes sure the steering is smoothly. Best of both worlds kind of thing. 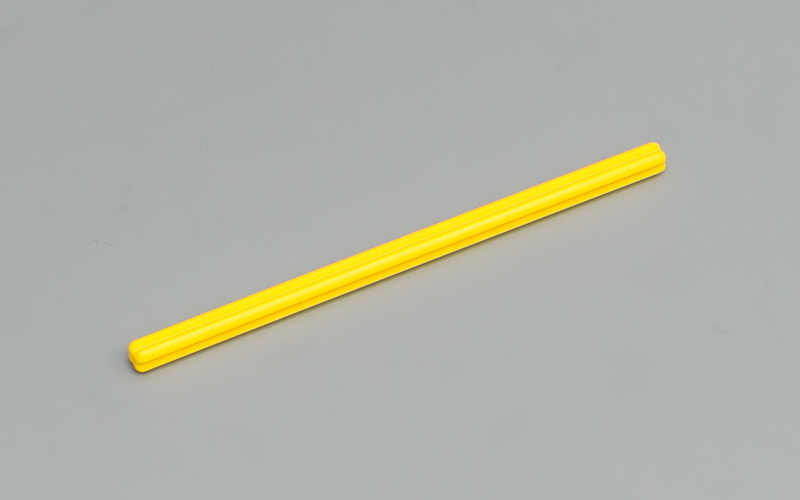 The yellow 1/2 bush limits the steering angle. 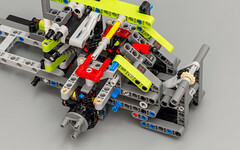 A limited steering angle is something that's bothering me frequently in Technic models. So I tried to remove the bushes and replace the 3L axles with 2L axles. 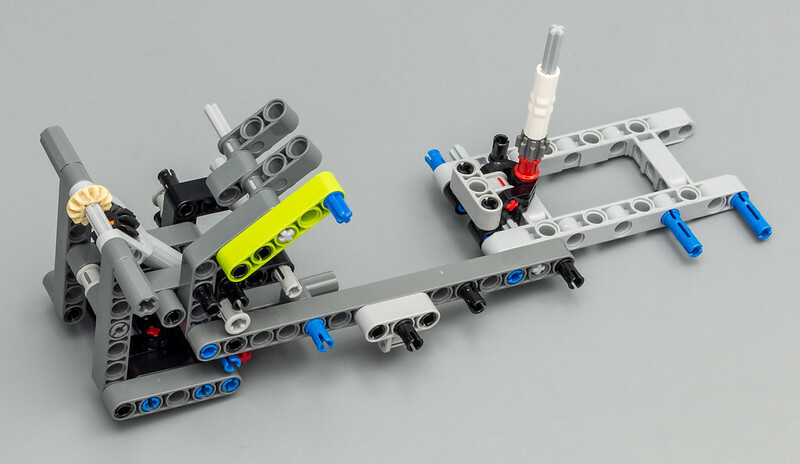 This does improve the steering angle. However, as you can see in the pictures below, there's a reason the steering angle is limited. The left tire is touching the chassis. We will need to work with the default setup. Which actually isn't that bad in the end. The following picture clearly explains why we need red 4L axles, while there are also black 4L axles in this set. Or does it? Clearly no rack and pinion steering. Instead there's a cleaver mechanism transforming rotational movement into linear movement and back into rotational movement again. 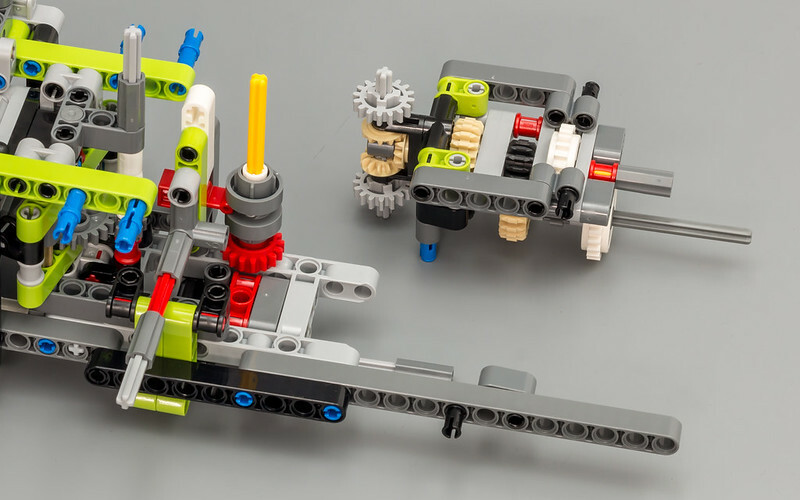 The linkage on the red axles can be moved into three different positions for the three different steering modes. 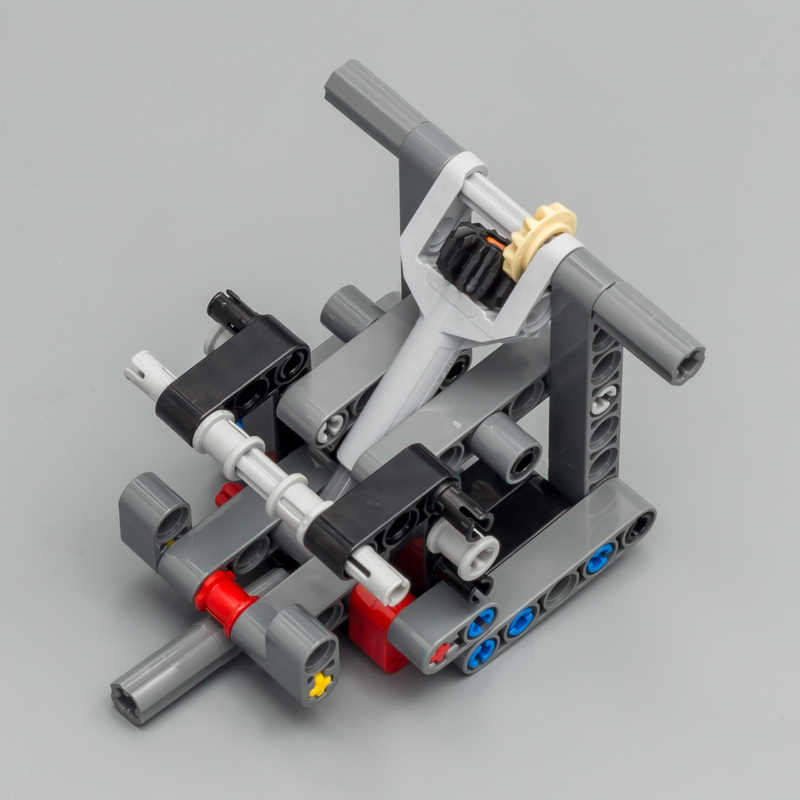 A manually operated lever on the back sets the linkage in one of three positions, selecting the steering mode. Stickers are used to indicate the different modes. Of course this mechanism is no surprise at all, since our good friend Barman already figured it out ages ago. Obviously a variation of the setup, but the basic are definitely the same. Well done Barman! In the picture below you can clearly see that the PTO runs from the front to the back. 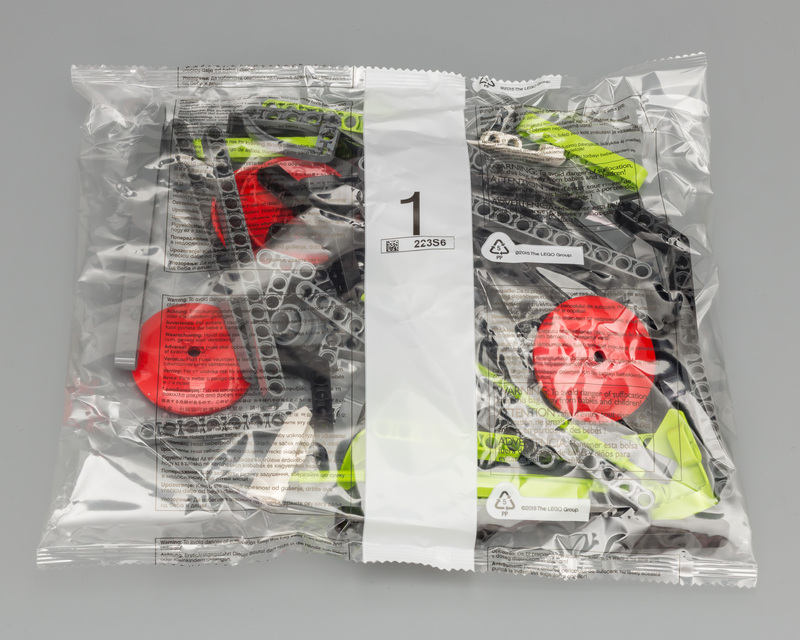 Even though this model doesn't have a powered front attachment, it's prepared to have one. Kudos to the designer for this feature! 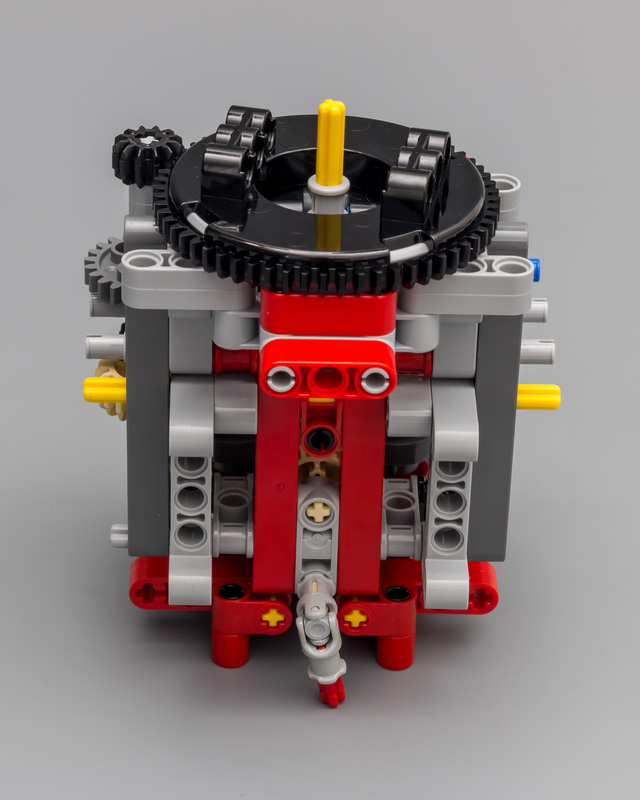 This gearbox is used to power the different functions. As you can see there are two Clutch Gears. One is for the PTO and the other one is for the cab rotation. 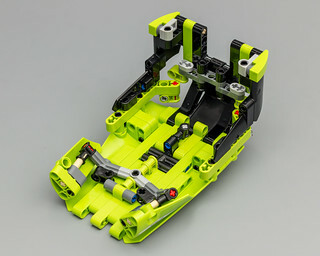 Here's how the gearbox will be attached to the chassis. Switching the change over catch results in changing direction of the function. 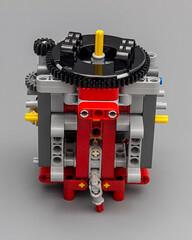 This is confirmed by looking at the left side of the gearbox, the "differential like setup". 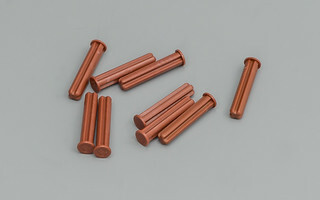 A Power Functions M-motor is used to power all the functions. Since there's no driving or steering involved, the M-motor is just fine! Here you can see a video of how the battery box switch works. This is a rather ingenious mechanism. 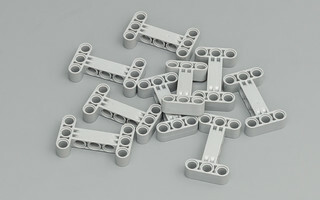 In the images below you can see why we need 54 1L Connectors. They might not be necessary, but I do like 'em. 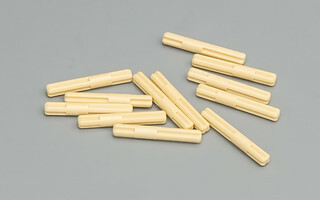 They are aesthetically pleasing and avoids having gaps in the model. 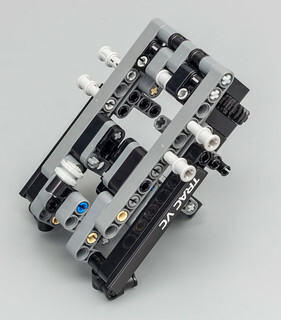 Otherwise bushes would be used, which definitely don't look as good as the 1L Connectors. 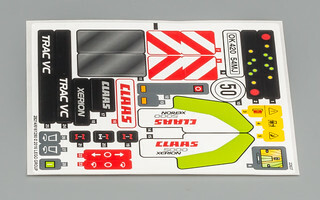 Here's a detailed view of the control panel on the side of the vehicle. 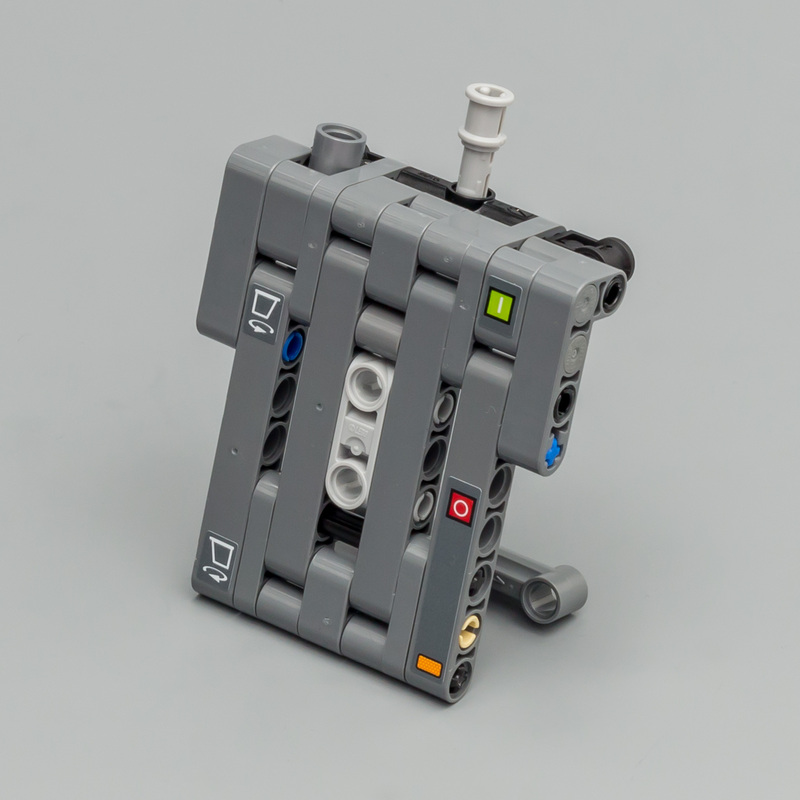 One switch will turn the battery box on and off, while the other rotates the cabin back and forth. Here's the control panel attached to the vehicle. This surely is one of the best looking control panels I have seen. 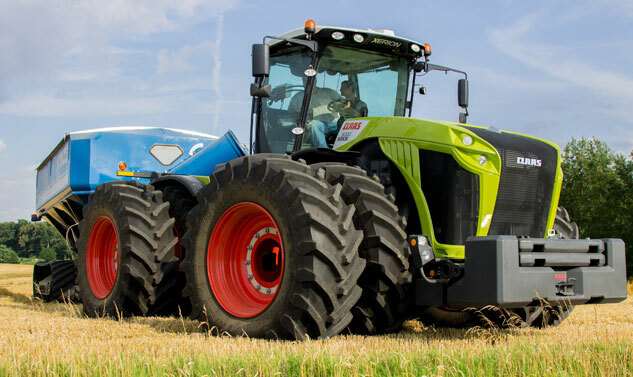 The lime green hood, combined with the white roof and red rims, is one of the most recognizable sections of the CLAAS. Unlike other hoods this isn't just a couple of panels and done. It's actually quite a big build. 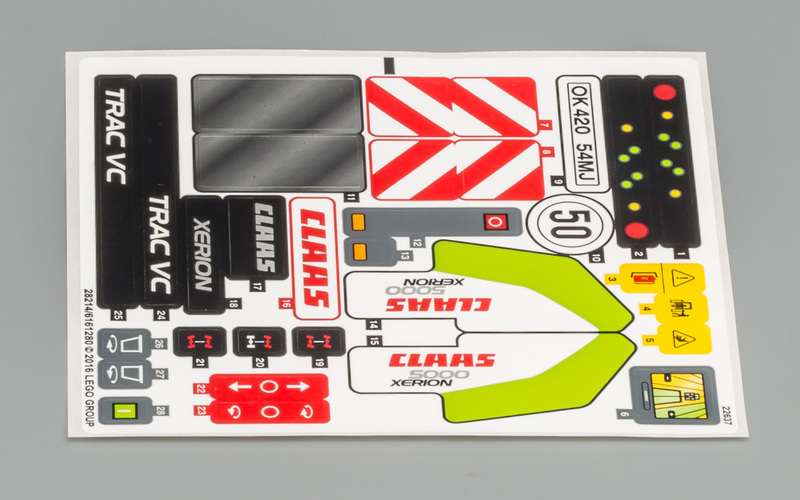 The front of the hoods actually needs a CLAAS stickers, which I forgot before taking pictures. 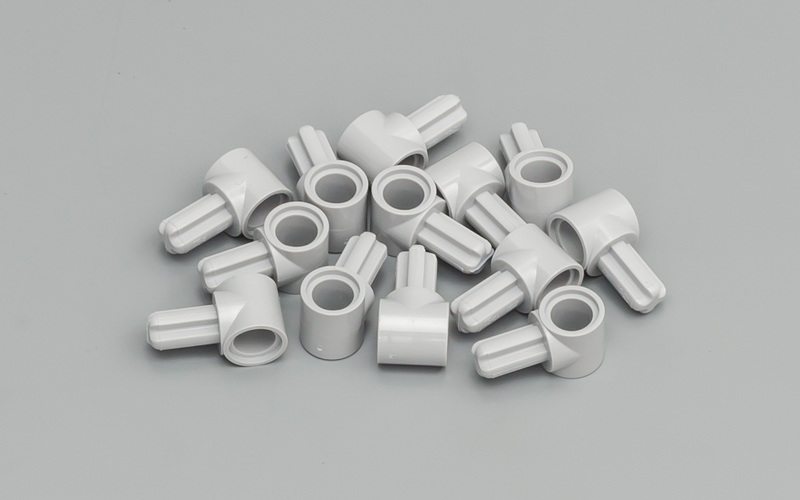 The hoods can be lifted and held up with a support axle. Usually you will see the fake engine, but now there's a battery box. To be clear; there's no fake engine at all. Which is perfectly fine given the fact that the battery box is well hidden inside the model. Closing the hood results in this pretty picture. I am already starting to like the looks of this model. The build also gets more interesting along the way. In the beginning there's much going on without really making sense. Seems like a bit here and a bit there. 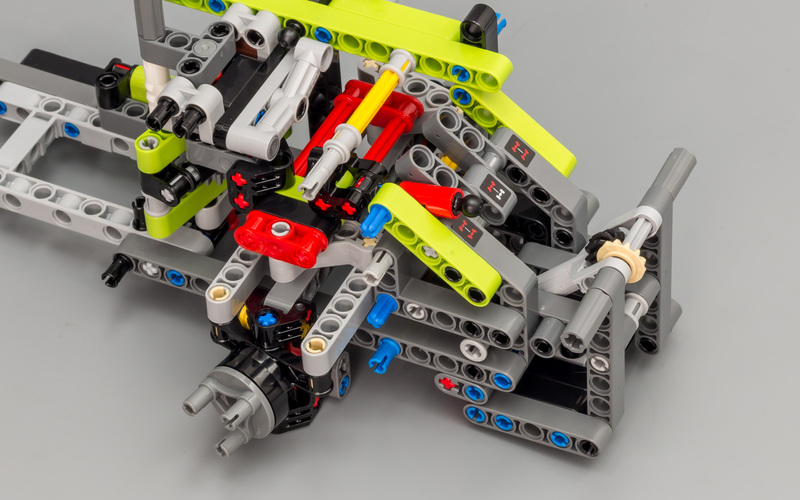 Some constructions seem rather flimsy. However, the further you progress, the better the builds get, to a point where it's actually a great building experience. Here you can see the base of the cabin, which actually has a nice feature. 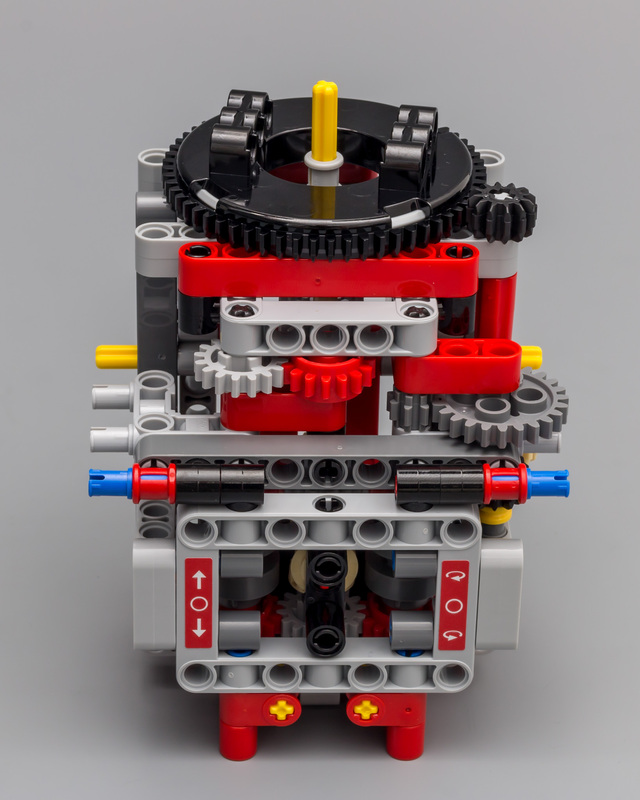 When the cabin rotates a little wheel underneath lifts the cabin a stud or two. 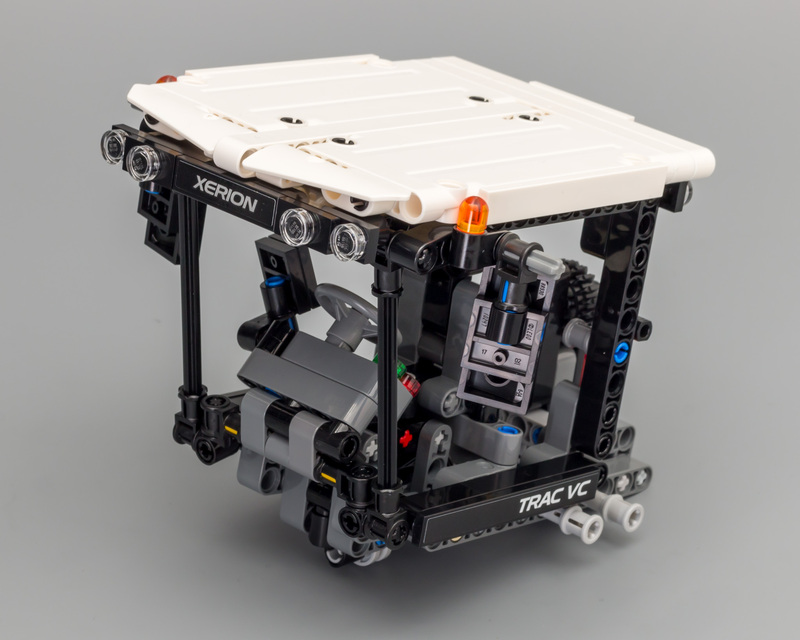 This results in the cabin freely rotating around its axle. When it has turned 180 degrees, it falls in place again. Here you can see the up and down mode of the base of the cabin. The finished cabin looks stunning!! The back of the cabin has some intricate details, like the fire extinguisher and the 50 km/h sign. In the cabin there a computer display showing the field. 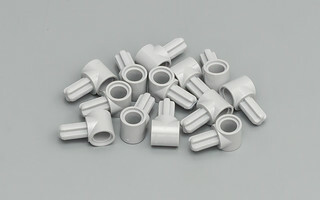 I think you can even fit a minifig on the chair. Here's a sequence of images demonstrating the rotation of the cabin. You can clearly see the raising and lowering of the cabin when it rotates. After finishing the cabin, you end stage 1 and the tractor is finished. I can only come to this conclusion: Yes, it looks great in real life too! And great is an understatement. This is one of the best looking Technic models ever! I wasn't a big fan of lime green, but it just went up a couple of notches on my ladder. Especially in combination with white and red! I can't think of a single thing I don't like about the tractor. 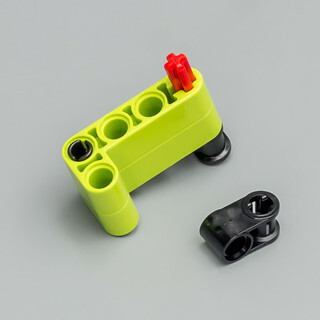 Even the battery box is nicely hidden inside the model, while it still can be easily switched on and off. Cabin rotation is how it's supposed to be and there's a front and back PTO. Simply amazing! 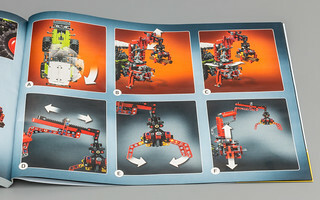 After the 1st stage, you enter the 2nd stage...building the crane! I have included a picture of the crane on my work desktop, instead of my photography desktop. 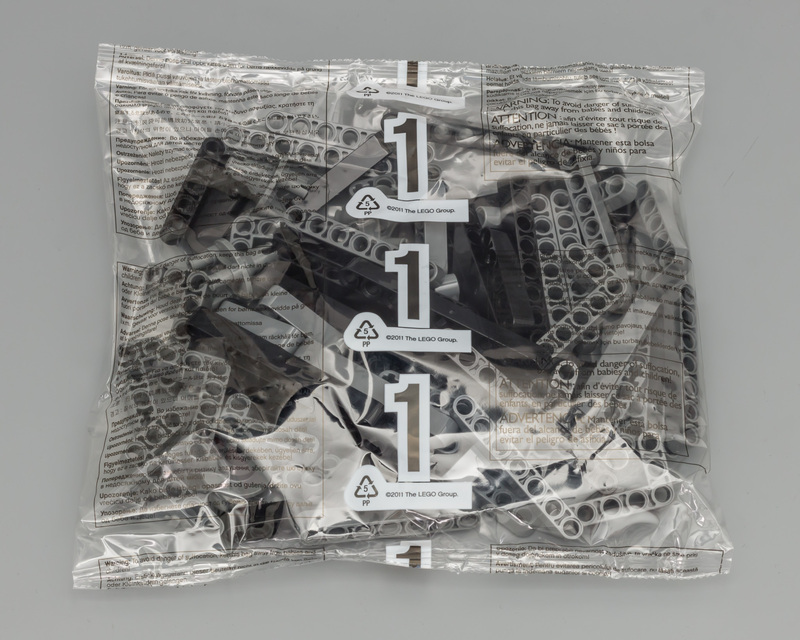 Looking at the pictures, it appears that I have no OCD when it comes to arranging parts before the build. On the left side of the crane (where I already applied the stickers) you can see the controls for the crane. Two levers, both with an up and down mode. One of them will rotate the crane, while the other will raise and lower the boom. For all you photography enthusiasts; these two pictures are taken with f14 instead of f20, resulting in a sharp picture but slightly blurred (out of focus) background. This draws attention to the model, while still being able to figure out what's going on in the background. I used to shoot everything with f20, which would have resulted in an entirely focused picture. Three more images of the base of the crane. 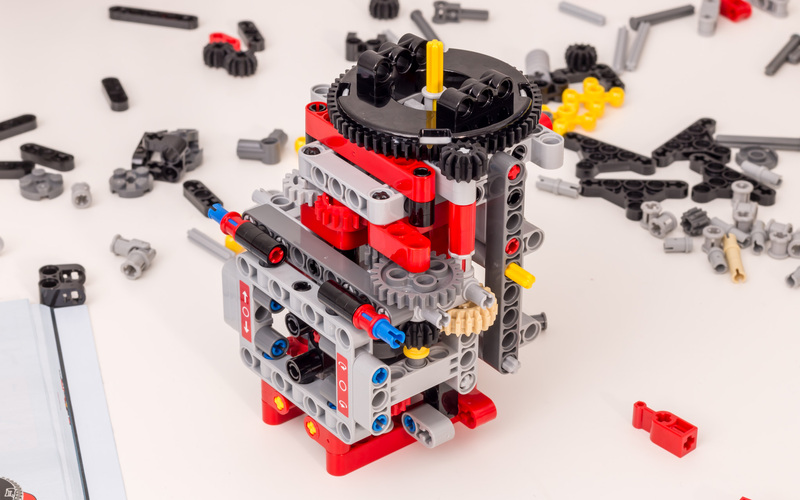 This time without the unnecessary cluttering with extra parts. Lo and behold, the crane! First of all, I am not the biggest fan of cranes. Why not? Because they have a tendency not to work properly, especially the Pneumatic ones (apologies to the Pneumatic fanboys). Therefor it's worth to mention that I actually like this one. 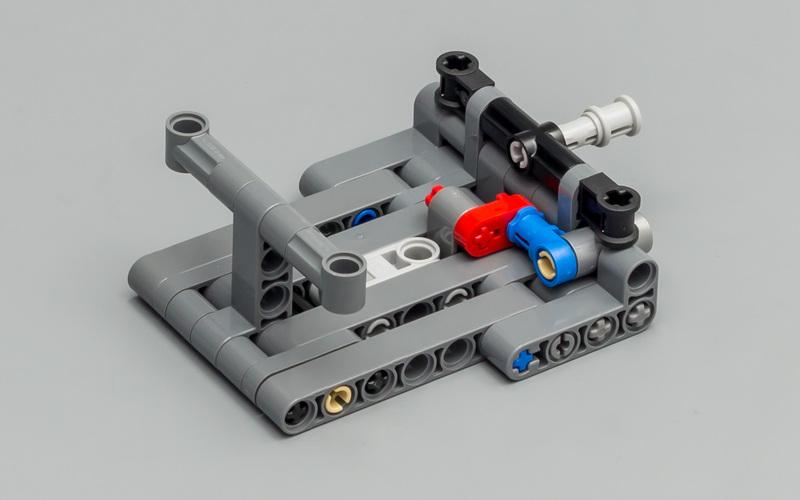 A decent design with functions that actually work. Admittedly the manual functions are not that great and maybe a bit flimsy, but that will always be the case when building in this scale. 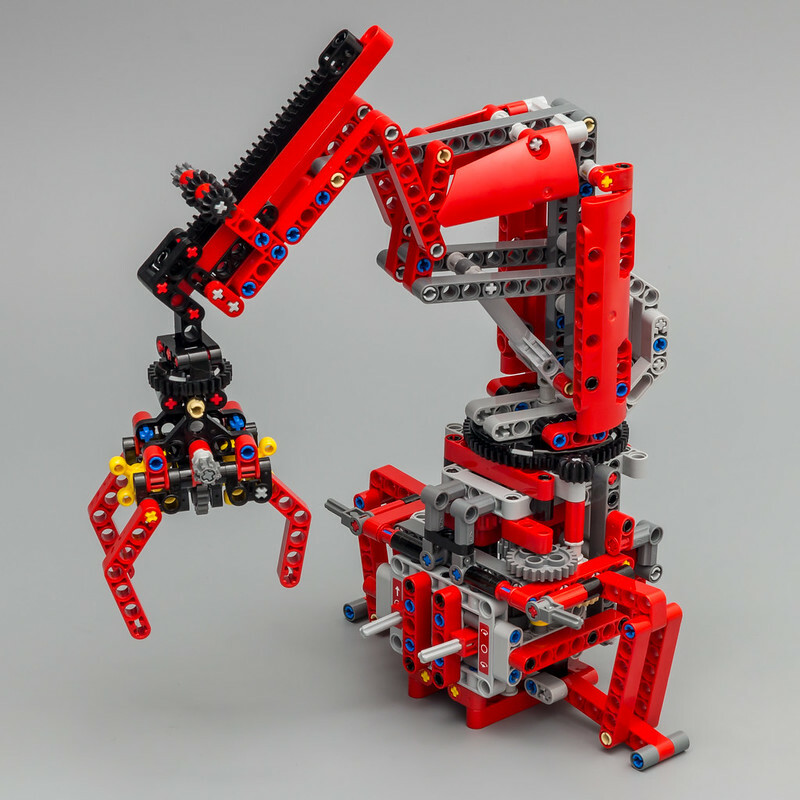 Most important are the two motorized functions, which work like a charm. The mechanism to attach the crane to the tractor is nifty too, although it can be a bit of a struggle to attach it to the PTO. This takes some practice. 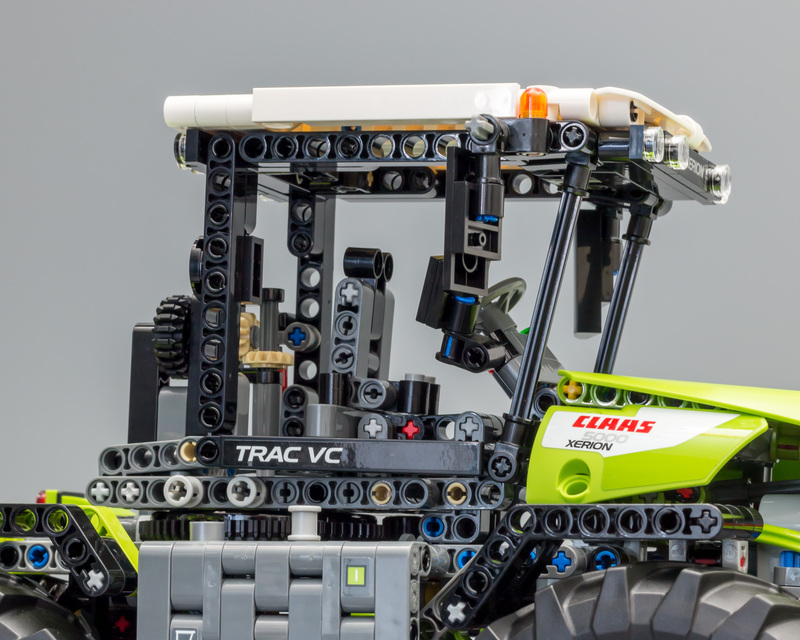 Meet the CLAAS XERION 5000 TRAC VC! I have said it before and I will say it again; this is one good looking model. 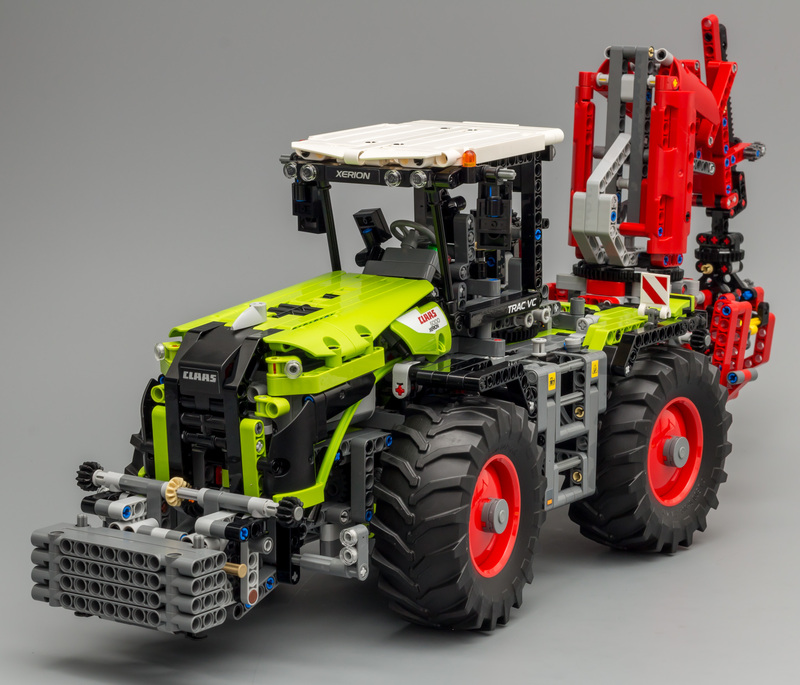 The shapes, the design, combined with the CLAAS color scheme makes it really stand out. Admittedly, the crane doesn't improve the looks of the model. Being an attachment, I don't really mind. 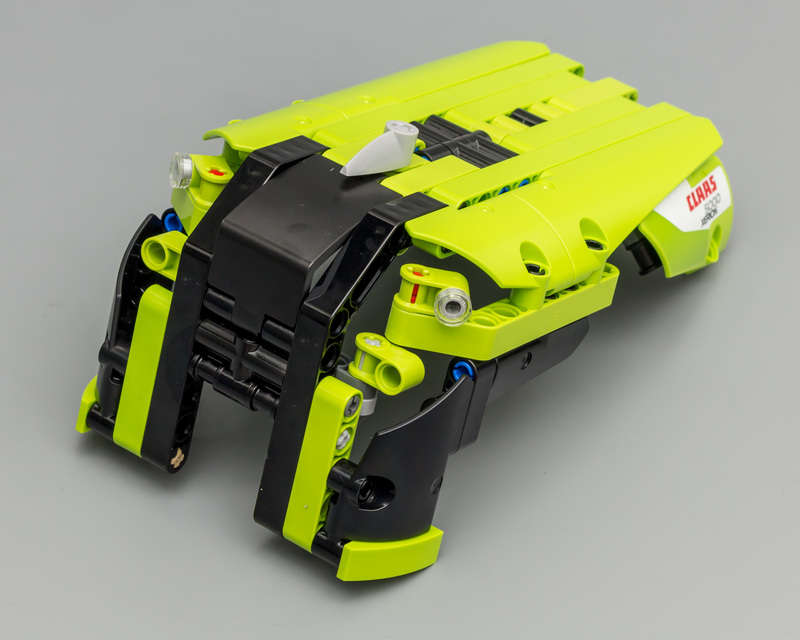 The nose of the CLAAS looks so cool. Especially with the weights on the front attachment and those new tires. I really love this picture. Another think I absolutely love is the cabin of the model. All kinds of small details and the overall look is stunning. The crane is....well.....a crane. It's not ugly, nor is it a beauty. Technically it's working properly, which is the most important thing. It does kind of bend over a bit, but it doesn't bend the chassis. It's caused by the way it's mounted to the rear attachment. Raising the attachment will straighten the crane a bit. The rear attachment is quite solid, which is good thing. The outriggers need to used for extra stability. This side view show what I mean by the crane leaning over. The rear view of the entire model. I love the fire extinguisher and the 50 km/h sign! Another front view of the model. 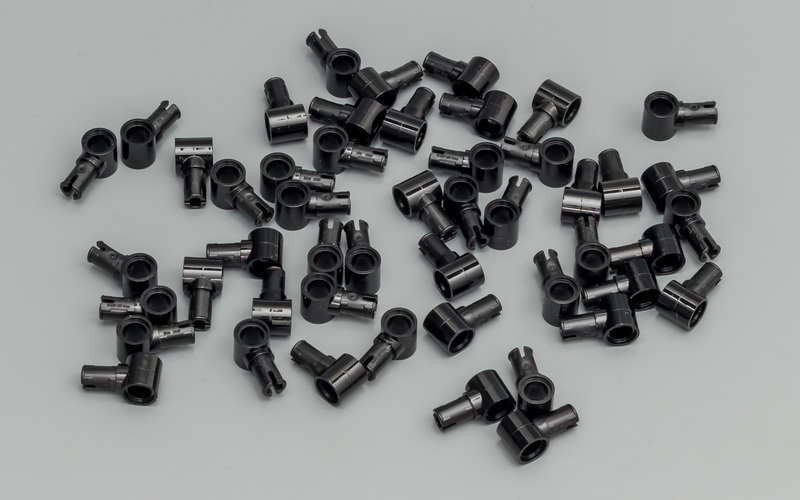 Quite a few 1L Connectors left. Makes you wonder whether I skipped a few. Or they are used in the B-model. So the model looks good. Does it function properly?! And what exactly are the functions?! 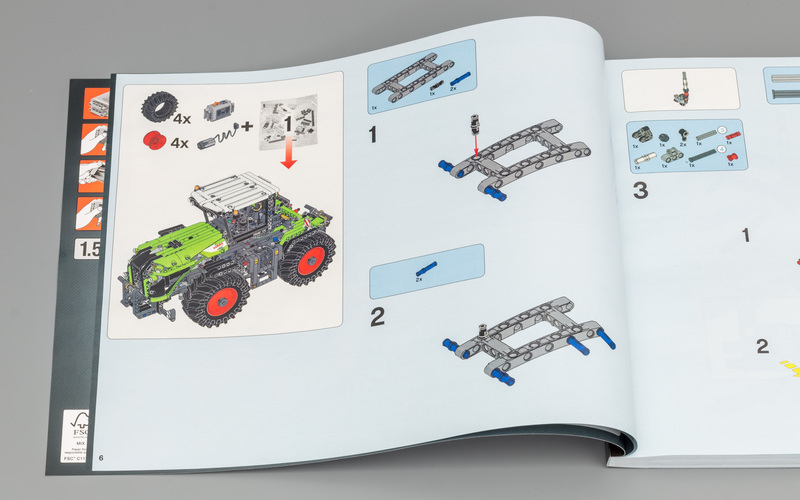 After the last building step, the manual shows four pages with functions! 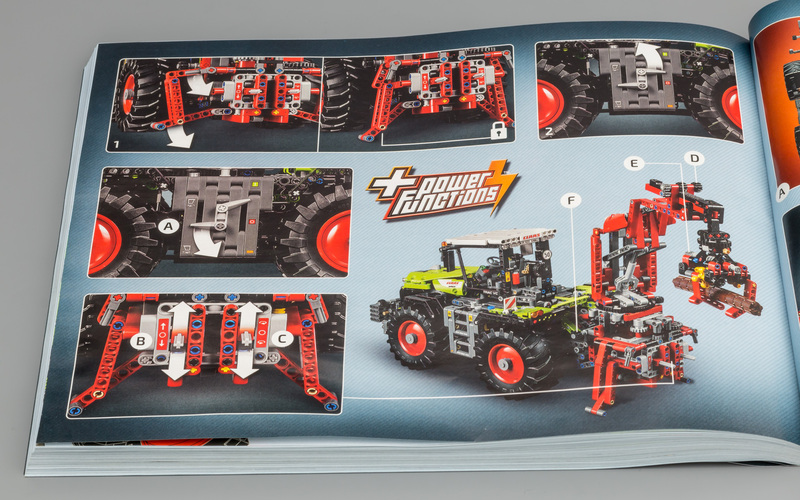 The first two pages concentrate on operating the crane and cabin, using the PF functions. 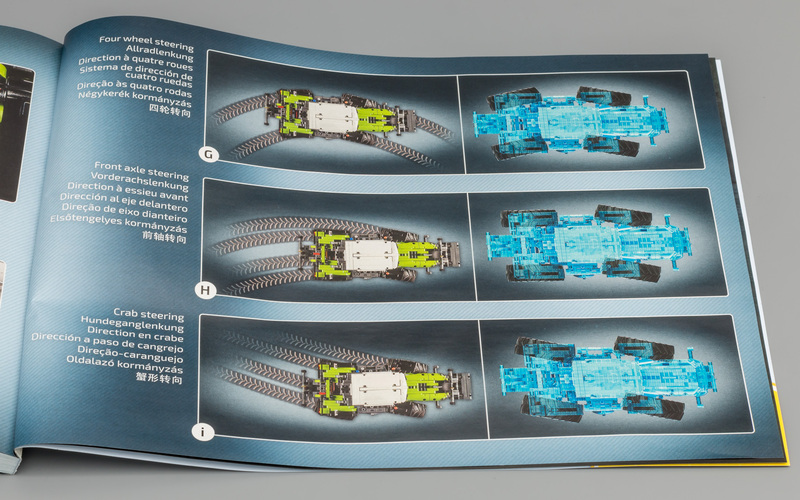 The other two pages focus on the different steering modes. The front attachment is manually operated and can be raised and lowered. 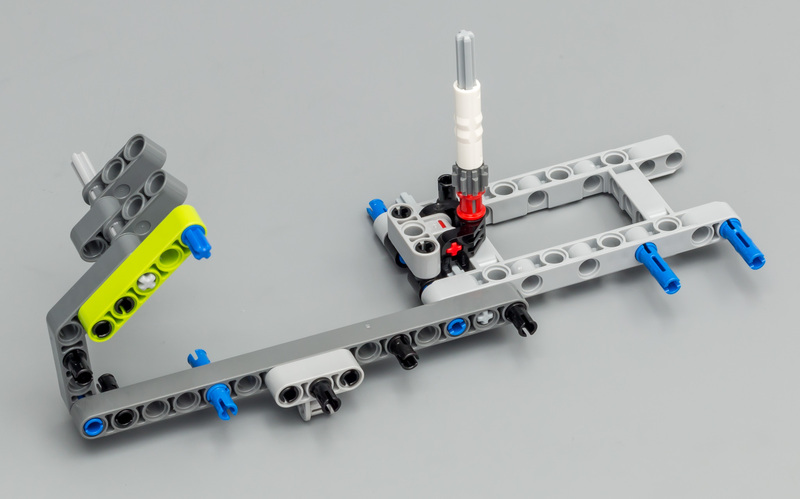 Attaching to the chassis is easy, so it can be easily changed for another attachment. 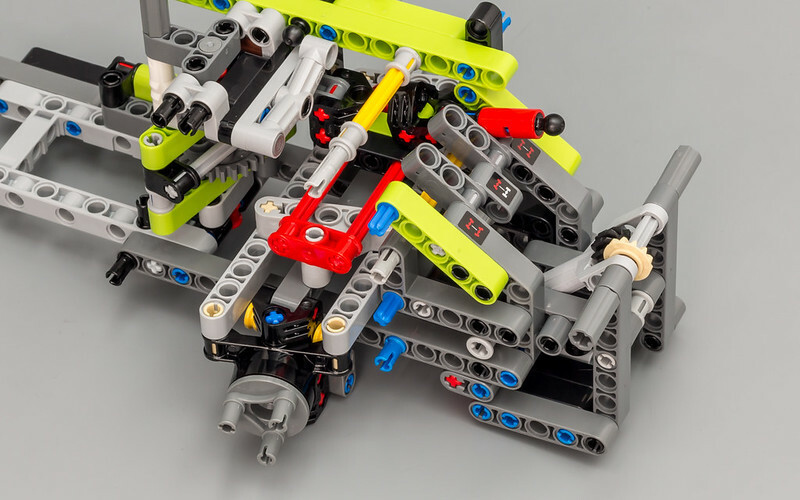 There's a front PTO, which leaves you with loads of options. I'm sure we will see some nice MODs being published in the future. Then there's the three mode steering. Basically the steering modes work fine. 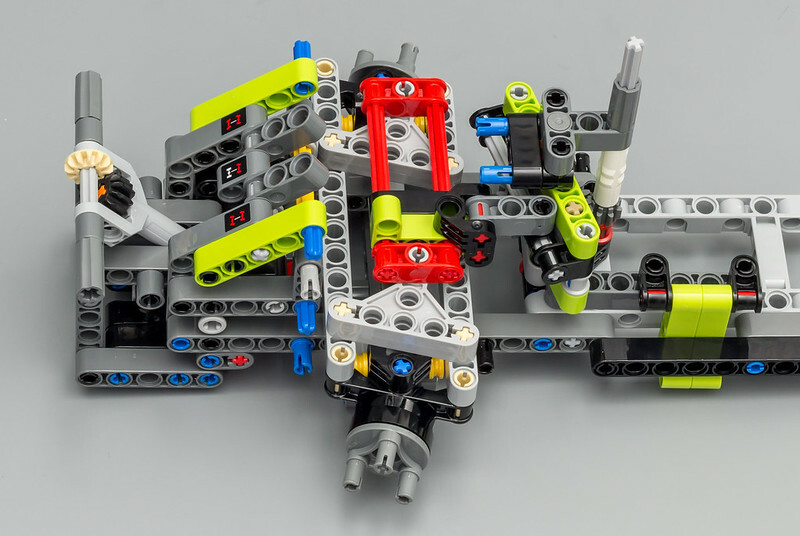 The mechanism is very clever. So it all good? Well, there are some minor issues. Turning the steering gear needs quite a bit of force, which can result in accidentaly turning the cabin instead of steering. Another issue is the significant amount of slack in the steering mechanism. 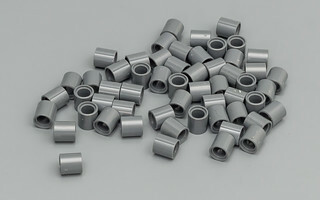 New wheel hubs were introduced this year, but they are no improvement in terms of slack. This model is best steering when driving it. 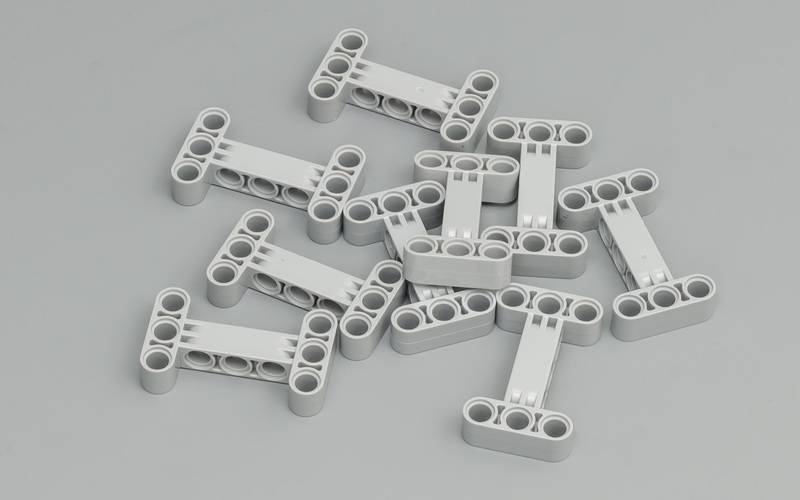 This will reduce the amount of force on the steering linkage and it will also diminish the slack. All in all the steering modes work properly and the entire steering mechanism is awesome. This makes up for the lack of rear wheel steering in the Porsche! Like I said earlier; usually I am not a big fan of cranes. However, this one works properly. The motorized functions have been implemented very well. 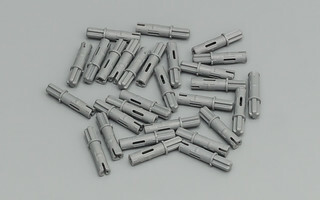 They are easy to operate, without confusion about which function does what. The manual functions work as expected, nothing special. I haven't paid much attention to the tires so far. I reckon they deserve a review of their own. Enough has been said about them already, so I will simply echo what other have been saying; they are awesome! Best tire since the Unimog tires. They have enough grip for Truck Trial. One thing I am not sure about though is how well they will stick to the rim. As you can see in the video, they detach pretty easily. Something which might happen when driving through rough terrain. 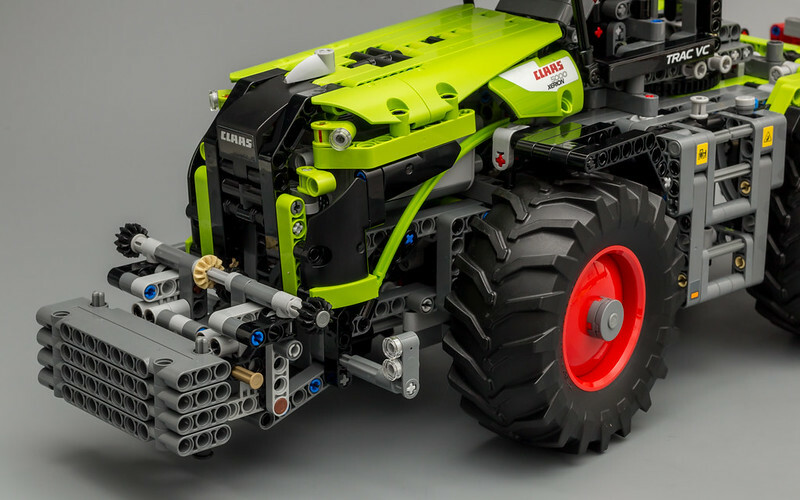 I hope TLG will release a smaller version of these tires in the near future, for other tractors or even combine harvesters. Both the attachments can be mounted and dismounted easily and the mechanisms to do so are nifty. Attaching an axle to the PTO can be tricky, but it will get easier after some practice. 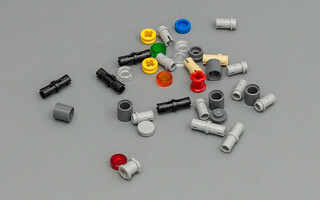 To summarize how I feel about this set is pretty easy. I love it! This set has everything a proper Technic set should have. Stunning looks and lots of great functions. 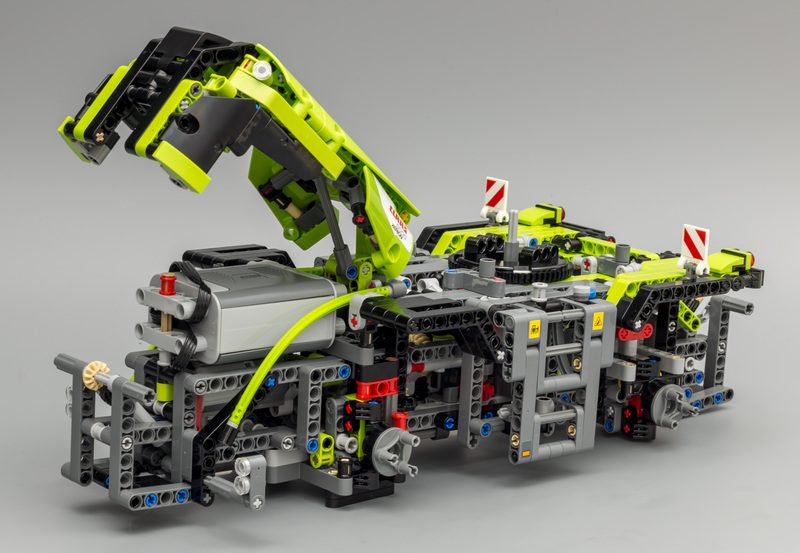 Not sure if this is the best Technic set ever, but it is the best Technic set I ever reviewed. I'd like to stress that these cons are really minor cons! 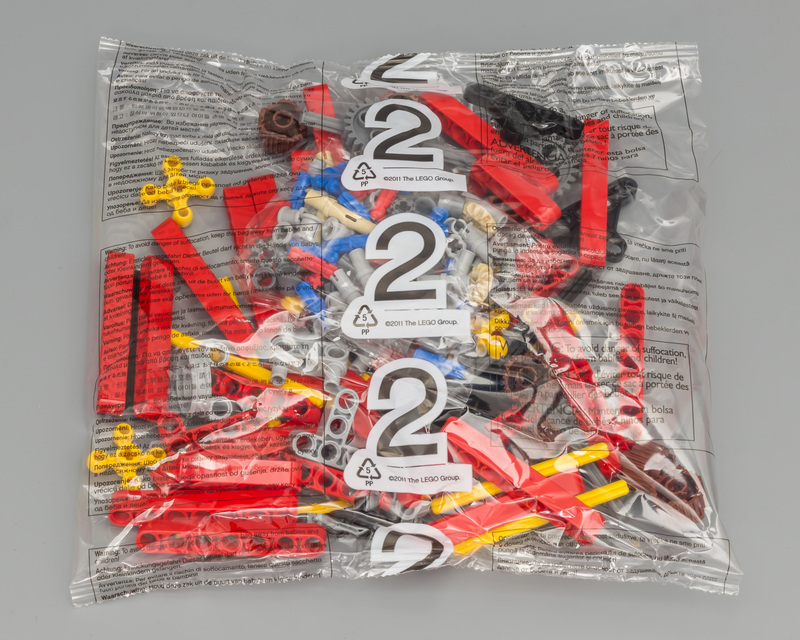 Okay, so how do I grade this set? CLAAS written all over it. Looks amazing. Starts a bit unstructured, but ends well. Can't do any better than this. High quantities of new pins and connectors. Oh, and them tires! This is what to expect of a big Technic set. 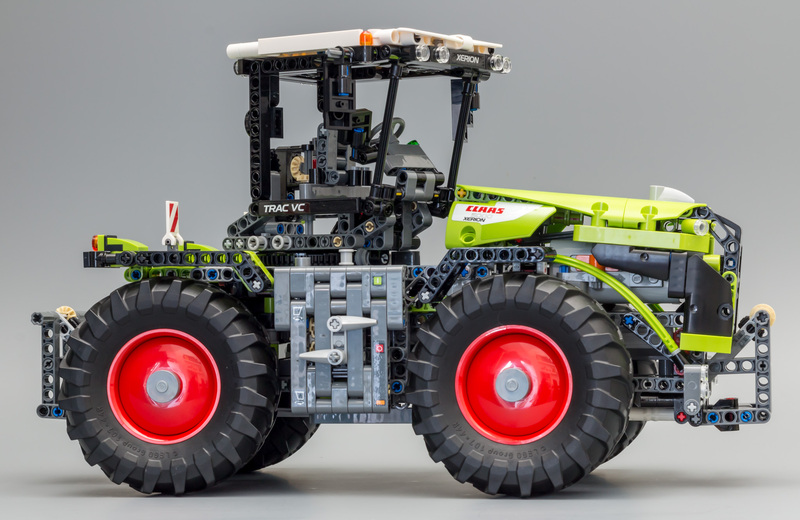 And what to think of a potential new CLAAS Lexion Combine Harvester with new smaller versions of the CLAAS tires in the rear. Yes please! Thanks you for reading this review. All pictures can be found in my album. Again, sorry it took so long! There's enough information available already, but I hope you still enjoy reading it. I haven't double checked the content, so if you see any mistakes, let me know. Great review as always. Thank you for all your hard work Jim. If you'd not told us why your review was delayed I'd have put it down to the time needed to take all those beautifully shot photos. Outstanding. Thanks mate. Funny thing is that building the model and taking the pictures don't take quite as long as the write-up. Well I guess it's 50/50 for building and pictures vs the written part. Thank you for the great review and the very high quality photo's! Another great review as usual Jim ! And great looking photos ! Just can't see the videos yet. When will it be possible to order the new tires and rims from TLG ?? Just can't see the videos yet. Are you sure? The videos have been made public. Thanks for an excellent review! 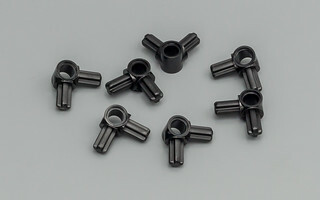 I discovered this little thing: "If you are in need of Axle with Pin Hole from 2016, look no further. 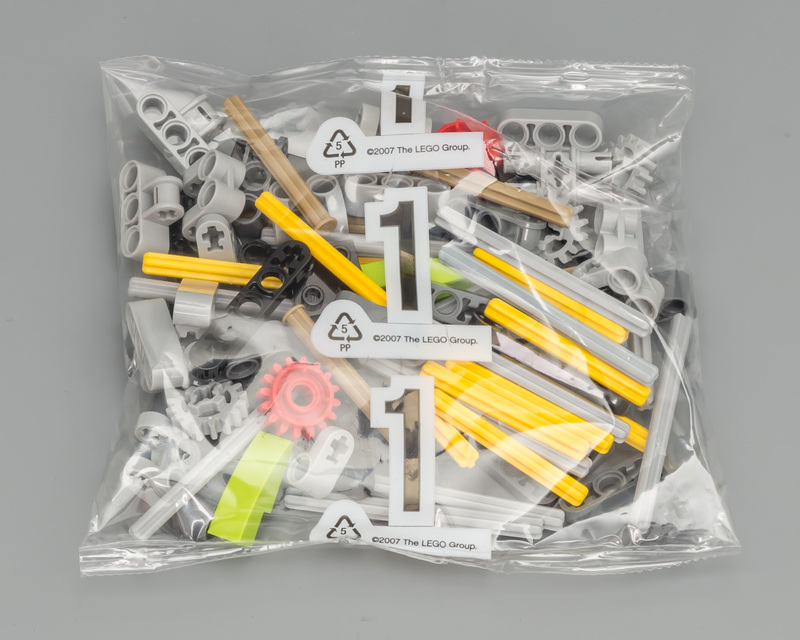 This set contains 49 of 'em. Yes that's right, 49!! 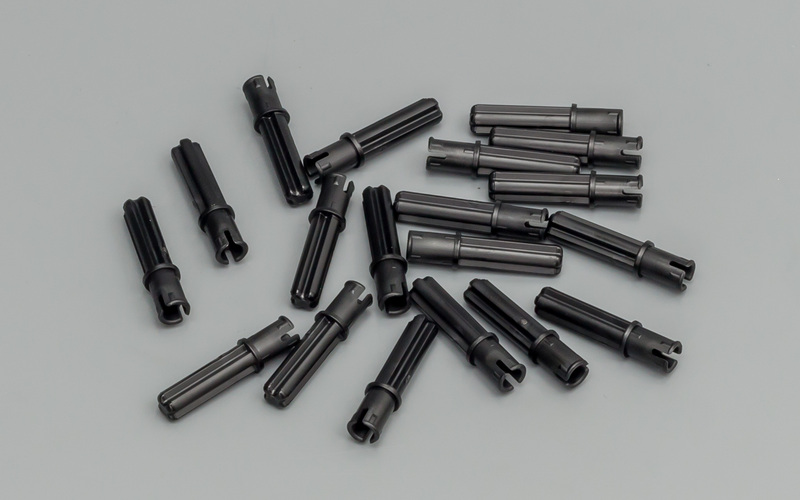 And 14 of its axle counterpart Pin with Pin Hole from 2014." According to the parts list, it seems like the amounts have been swapped between these two. The pictures also indicate the same. Thanks. I will correct it. Nice review and good pictures. For me this is the winner this year, followed by the Volvo EW160E. Thanks Jim for fully detail review again. At least clarifying one thing I didn't get it when seeing steering angle does not reach to maximal angle. New tires really are huge . 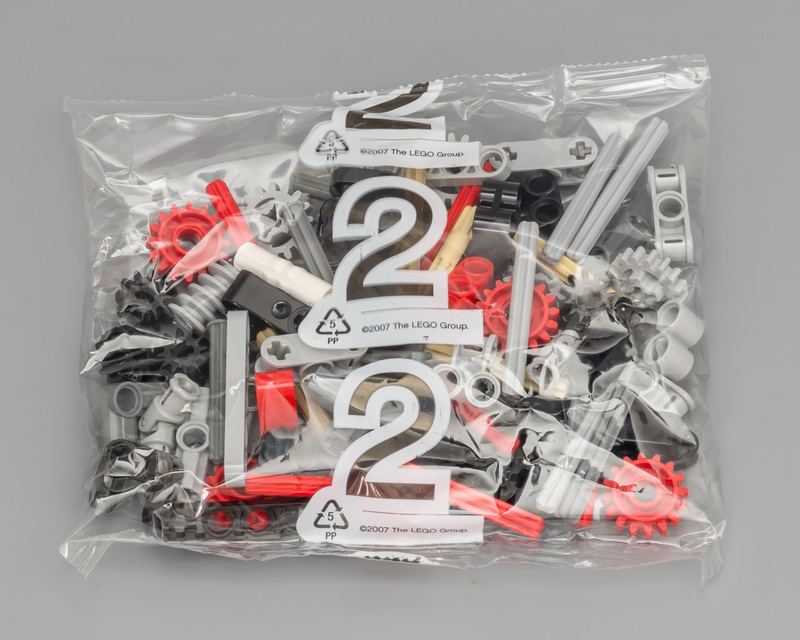 Thanks for this review - I just ordered the set, my first Technic set in many years. Hehe indeed. I was about to retake the picture, but I figured...let's leave it in the review. Very sharp! Could have figured looking at the left over parts. Thanks. I will include your image in my review. Both mirrors are not mounted correctly. 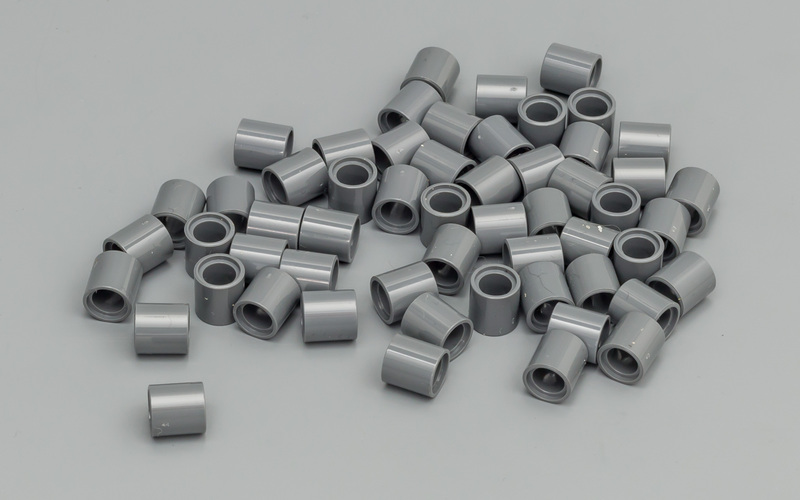 The end of the Gray axle should not be visible. 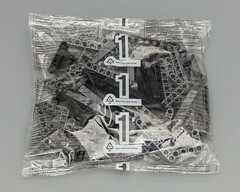 Curiously in my one received and built yesterday, I have only 2 1L liftarms as left over parts ! Edit: Understood, you missed 2 of them at the top of the mirrors. I must admit that I was somewhat hasty when building. That's the downside of pressure.